In the UK the largest of our native moths are the Hawk Moths. There are around 2500 different species of Hawk Moth in the world and several of those are found in the UK. 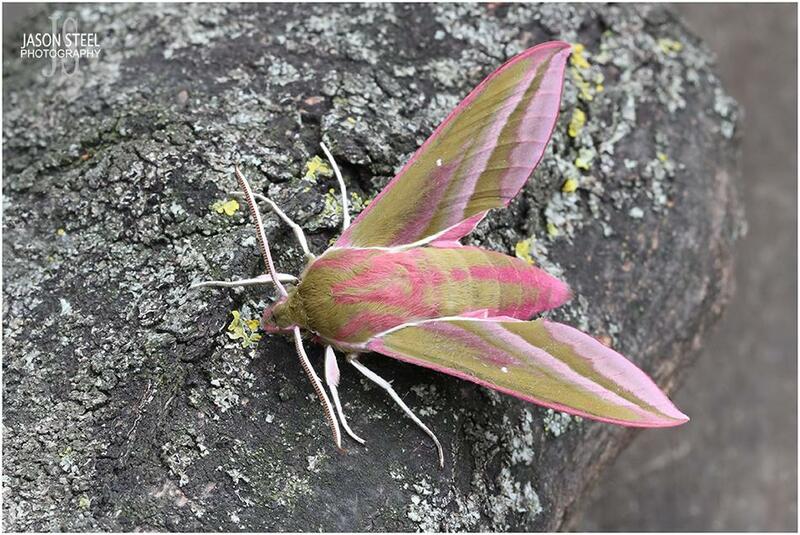 One of our most colourful is the Elephant Hawk Moth. 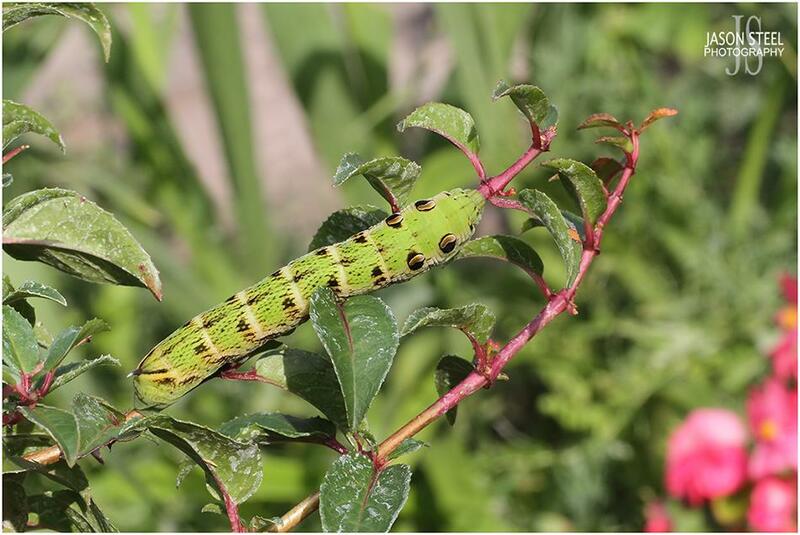 These large and brightly coloured olive-green & pink moths are also quite distinctive as a caterpillar too. 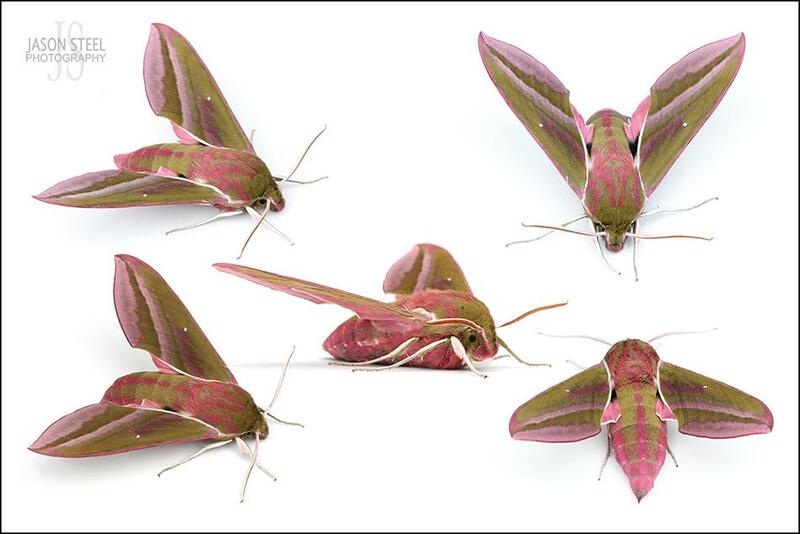 The Elephant Hawk Moth gets the "elephant" part of its name from its ability to withdraw the front part of its body like a trunk. If alarmed they can retract their head, the front of their body including the front six legs, back within their body. This makes the section of their body that has the large eye-markings look like a large head with big eyes. This can give the caterpillar a snake-like appearance and confuse and sometimes deter a would be predator. 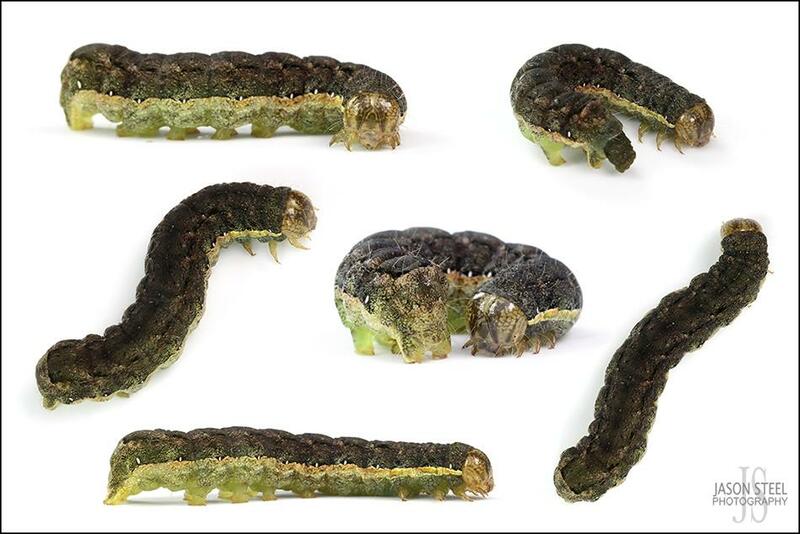 These caterpillars are usually brown in colour but are also less frequently seen in green as well. 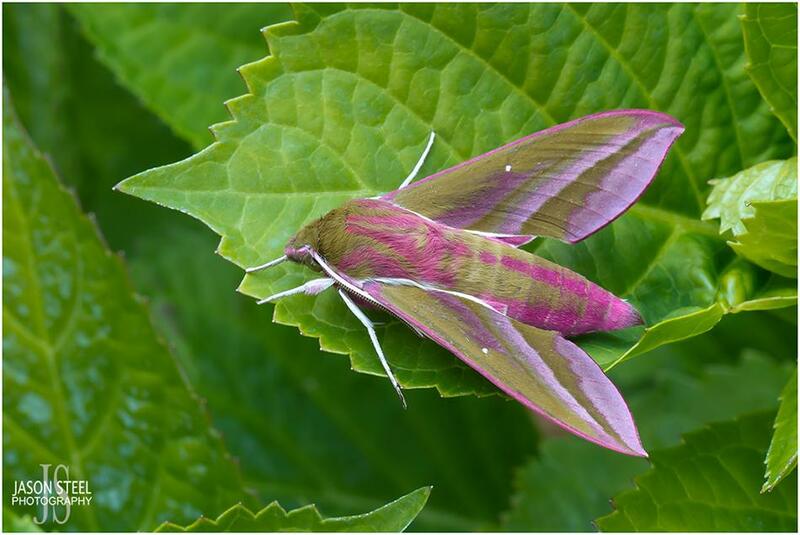 Elephant Hawk Moths are usually seen from May to July, and the caterpillars are usually seen from July until September. The caterpillars feed on Willowherbs, Bedstraw and Fuscia plants. The adult moths feed on nectar. Towards the end of August - September the caterpillars are fully grown. At this stage they come down to the ground and leave their feeding plants. 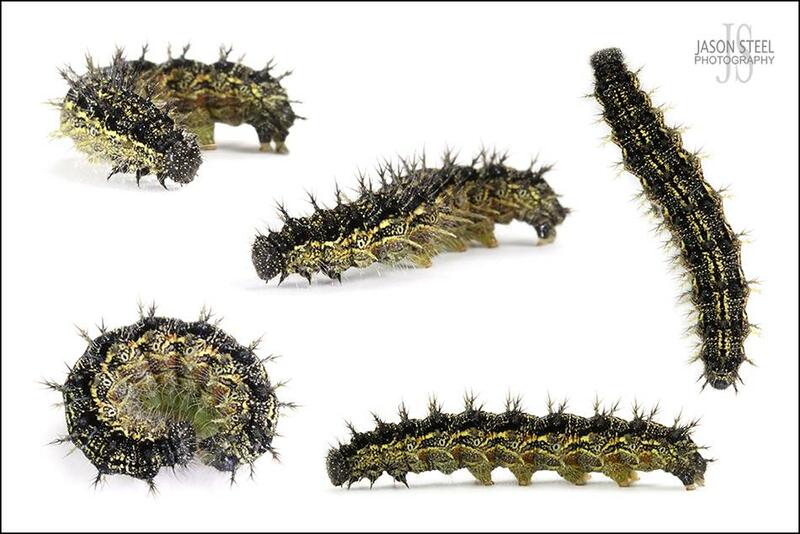 They now wander off looking for dry leaves, bark, loose soil and low vegetation to hide and pupate in. Here they will stay until the following May when they will emerge as an adult moth. 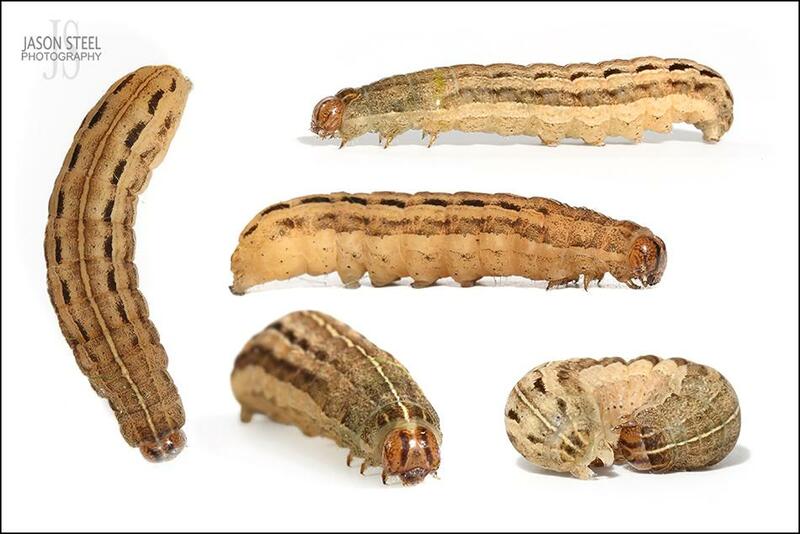 Once buried in loose soil and leaves the caterpillar secretes a sticky fluid through its skin, as seen in the bottom-left image above. This quickly hardens and within a few days becomes a hardened pupa. 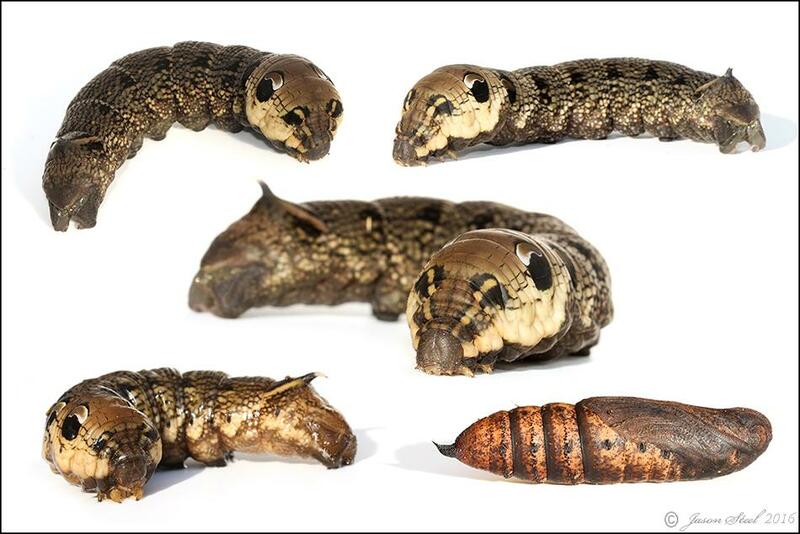 The bottom-right image above shows the pupa just a few days after the caterpillar left its feeding plants. It already resembles a moth inside the cocoon. 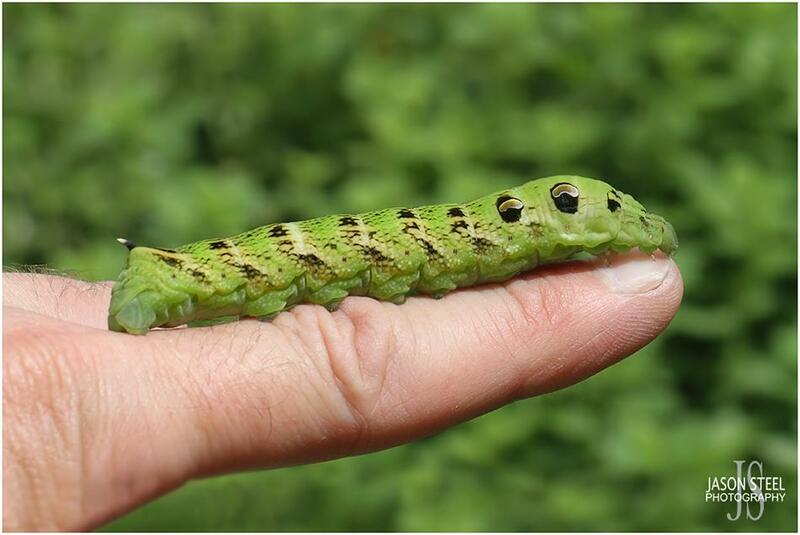 82mm Elephant Hawk Moth Caterpillar - Green variety. Shown on finger for size comparison. Both the caterpillar and the moth of this species are brightly coloured and easily identified. 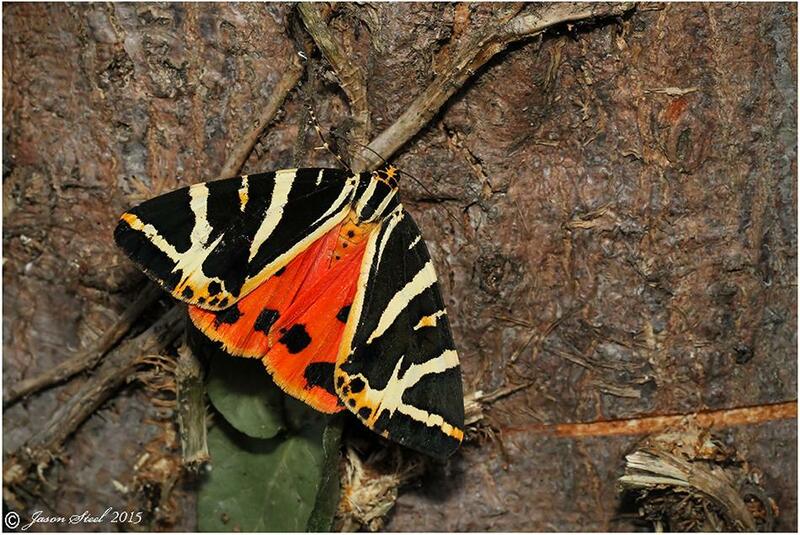 The caterpillar has black and orange stripes, whilst the moth is black and red. 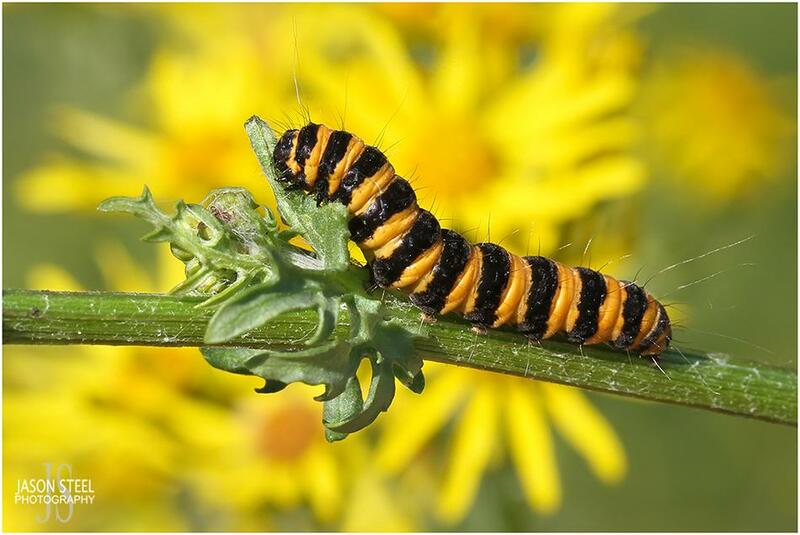 These caterpillars are vivacious eaters and feed almost entirely on yellow-flowered Ragwort plants. 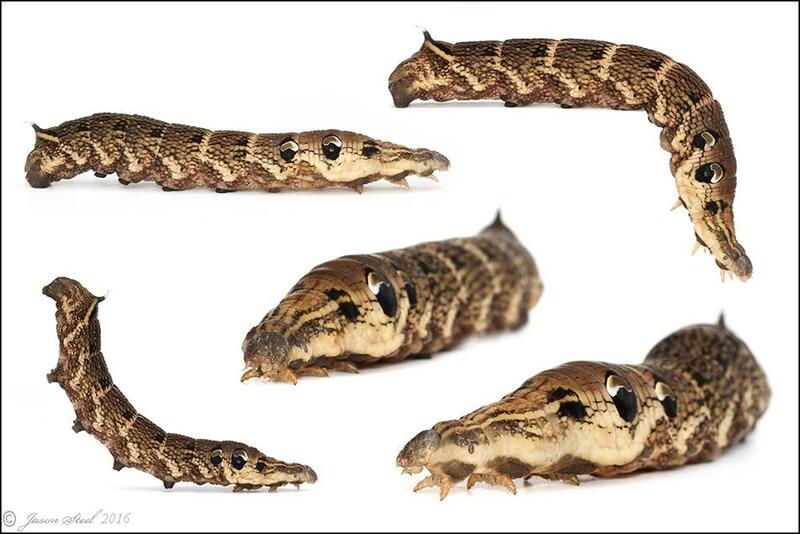 These caterpillars have tiny hairs on their body that release a mildly venomous toxin into human skin when handled. 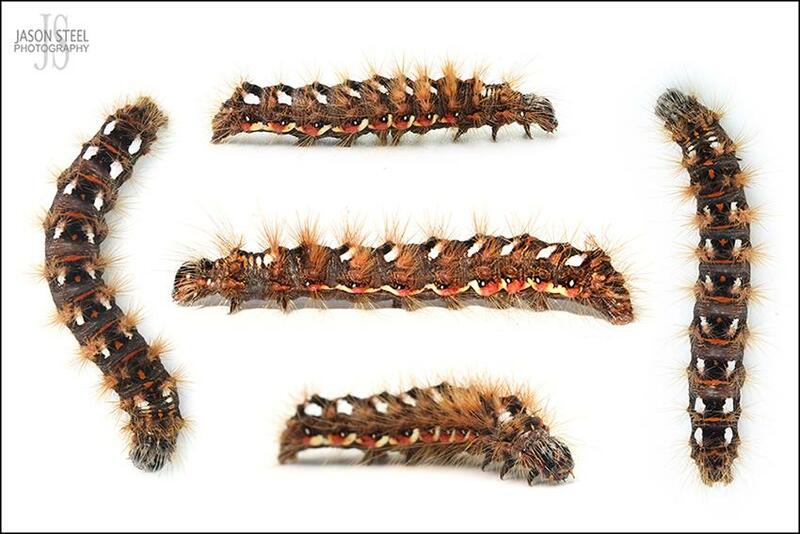 This toxin usually causes no more than an itchy or painful rash to anyone handling the caterpillar, but according to Wikipedia, more serious symptoms including asthma, osteaochondritis, dermatitis, haemorrhaging and even renal failure have been attributed to direct contact with this caterpillar! A common moth throughout the UK, with a wingspan of 32-35mm. Drab brown in colour, with one or two square spots on each wing. The caterpillars are nocturnal and grow to around 30-35mm in length, feeding on grass and other low vegetation. The caterpillars continue to feed through the winter, and in May they dig a hole in the ground and pupate. The adult moths emerge and take to the wing from late July to the end of September. 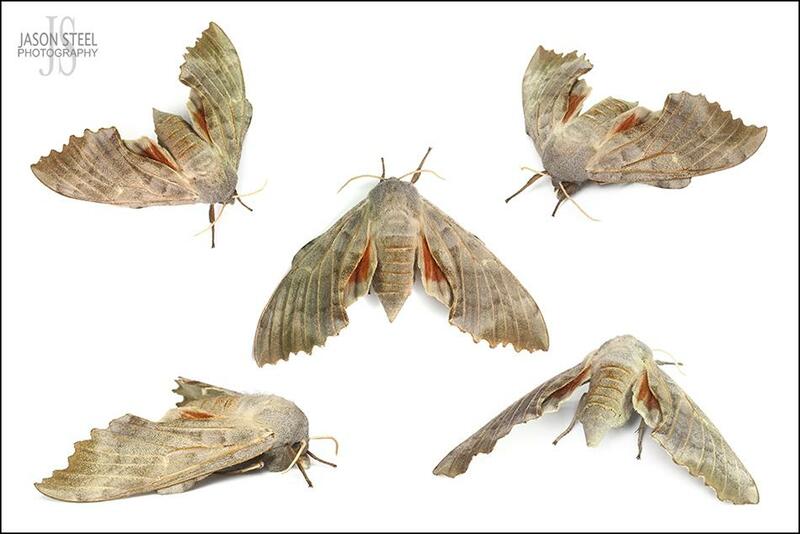 These moths are attracted by both light and sugar, and are easily caught in light traps. A medium sized moth with a wing-span of 28-33mm that is found across the UK and favouring damp woodland. Adult moths appear around May. 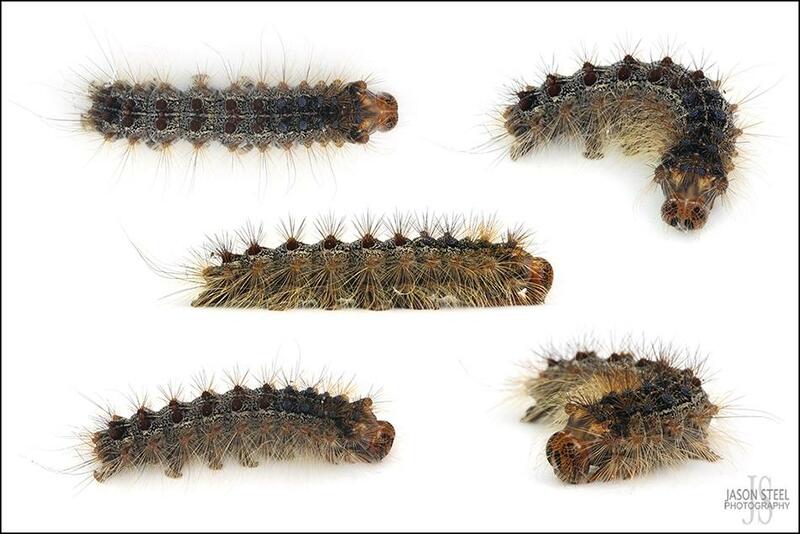 Caterpillars overwinter and appear in spring feeding on various herbaceous plants. 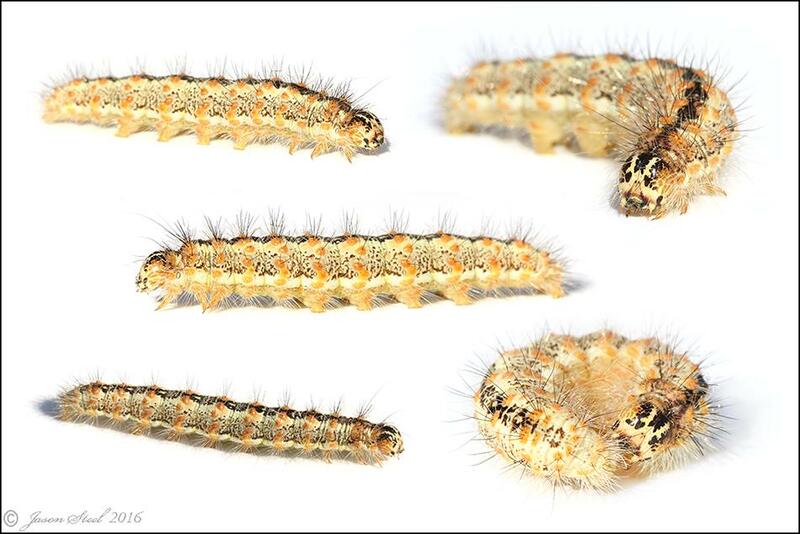 These ones were found feeding on Mint and Raspberry plants at night. Caterpillars grow to around 40mm before commencing pupation below ground. Once a very common species but due to the over use of pesticides numbers have seen a reduction of 74% in the last 25 years. The caterpillar of this moth is considerably more colourful than the adult moth which is a dull white colour. It is confined mainly to the SE of England but is also found at other coastal and river valley sites across the country. The caterpillar feeds on reeds and other plants found in marsh type habitat. 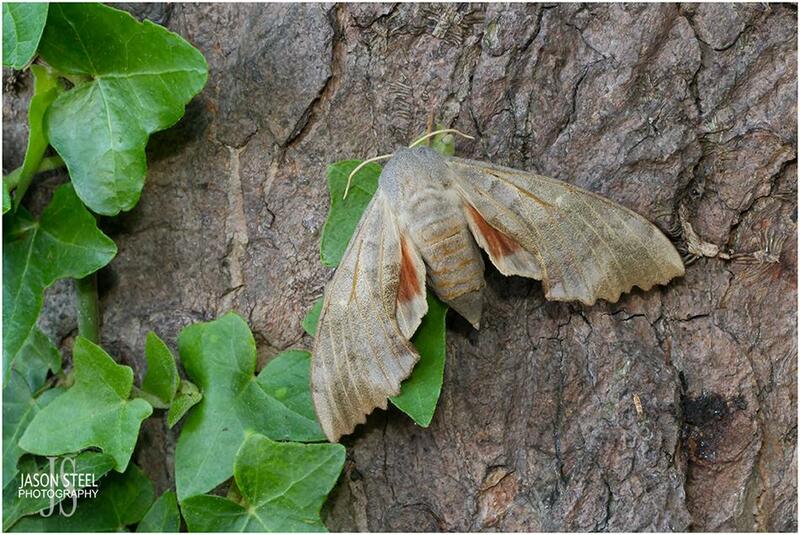 Adult moths have a wing-span of 32-40mm and are seen from April to late September from two broods. A small 20mm Vapourer Moth caterpillar (Orgyia antiqua) found in early June. Also known as "Rusty Tussocks" this is another species where the caterpillar of this moth is considerably more colourful than the adult moth itself. Adult males can be seen flying in daylight from July to October. Males are medium-sized with a wing-span of 38mm. The wings are orange-brown with white eye-spots and the Vapourer Moth has heavily feathered antennae. The female has a plump grey -brown body and is almost entirely wingless. 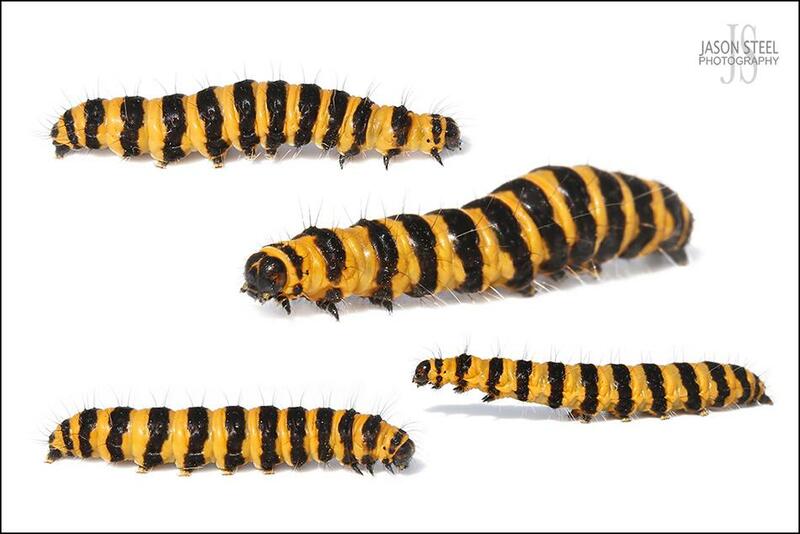 Caterpillars grow to around 40mm and can be found from May-September. A common moth across the UK with a wing-span of around 30-35mm. 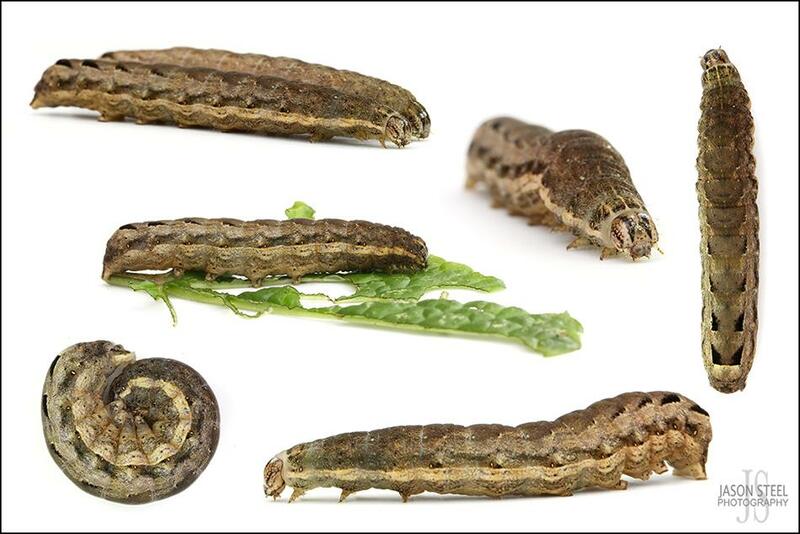 Caterpillars grow to 40mm in length and can be found feeding on a wide variety of herbaceous plants during the day. The first caterpillars can be seen in May, having overwintered, emerging from cocoons found amongst leaf litter. A medium / large sized moth with a wing-span of 52-65mm. 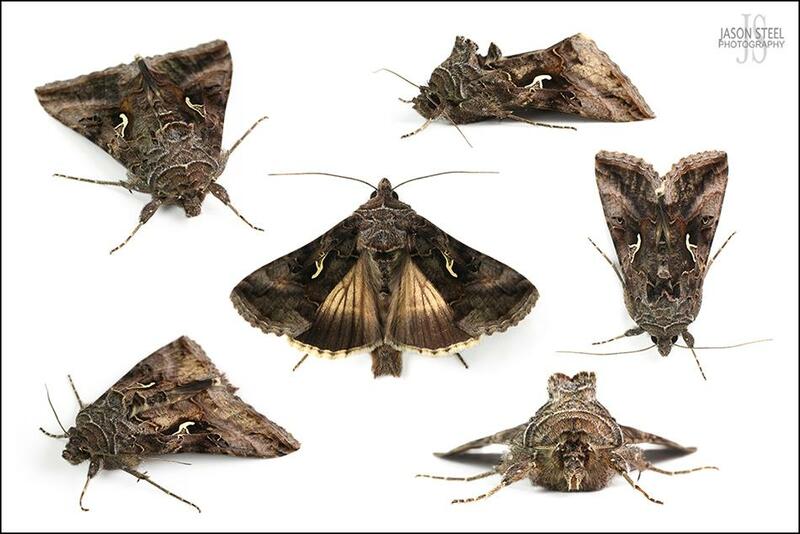 These moths are found across Europe and can be seen flying both day and night during July - September in gardens or hedgerows or on cliff-tops. Originally the only places in the UK where these were found were the Channel Islands, and occasionally in Devon and Cornwall (hence their name). But over recent years they have extended their range in the UK and have been recorded in SE London and North Kent since about 2005. This specimen was photographed on the SE London / North Kent borders, where this species is a regular visitor to my garden. 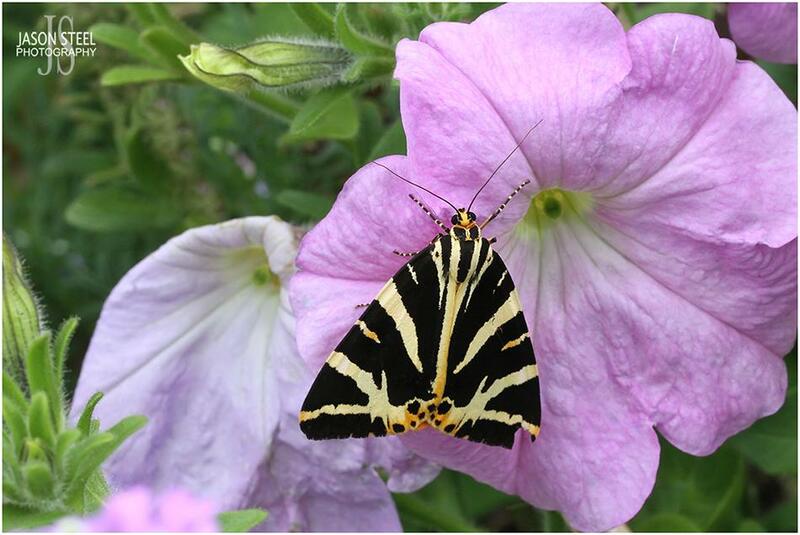 Adult Jersey Tiger Moths feed on nectar from a variety of flowers, with Buddleia being a favourite. The caterpillars feed on various herbaceous plants including Nettles and Ground Ivy. 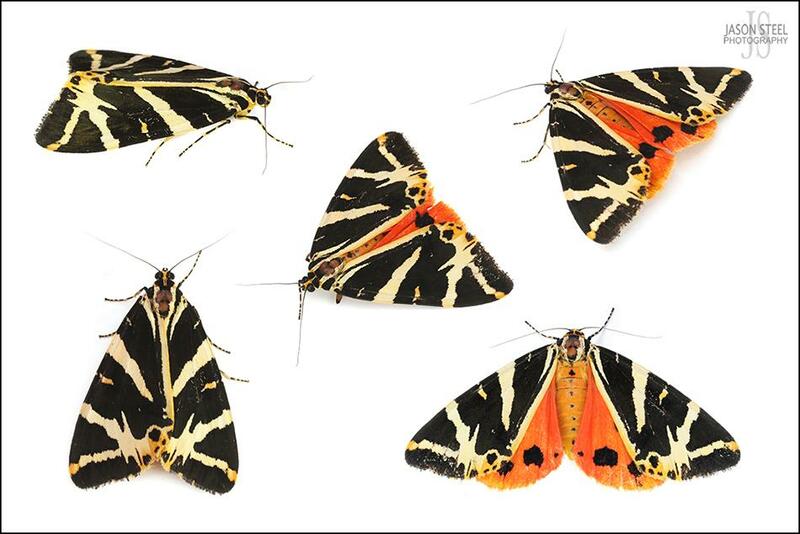 Despite the number of Tiger Moths declining significantly in the UK over recent years the Jersey Tiger Moth has managed to expand its range and has increased in numbers in parts of Southern England. 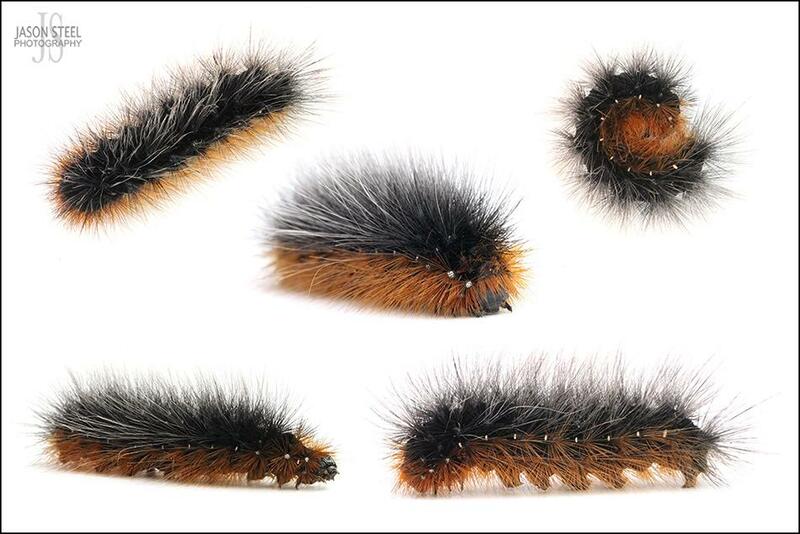 The caterpillars of the Garden Tiger Moth are often referred to as "Woolly Bear Caterpillars". Woolly Bear Caterpillars prefer to feed on Lambs Quarters, Violets and Clovers. They will also eat Dandelions, Nettles, Sunflower, Burdock and Yellow & Curly Docks. They are not a specialist feeder and feed on most wild plants and occasionally also eat garden plants including Spinach, Cabbage, Greens and Herbs. A medium-sized moth with a wing-span of around 30-35mm. 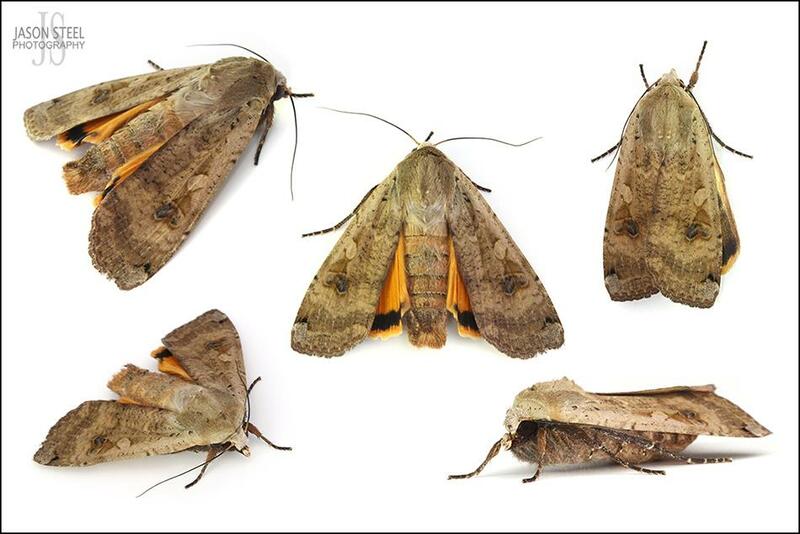 These moths are found across the UK and can be seen flying both day and night from April - September. 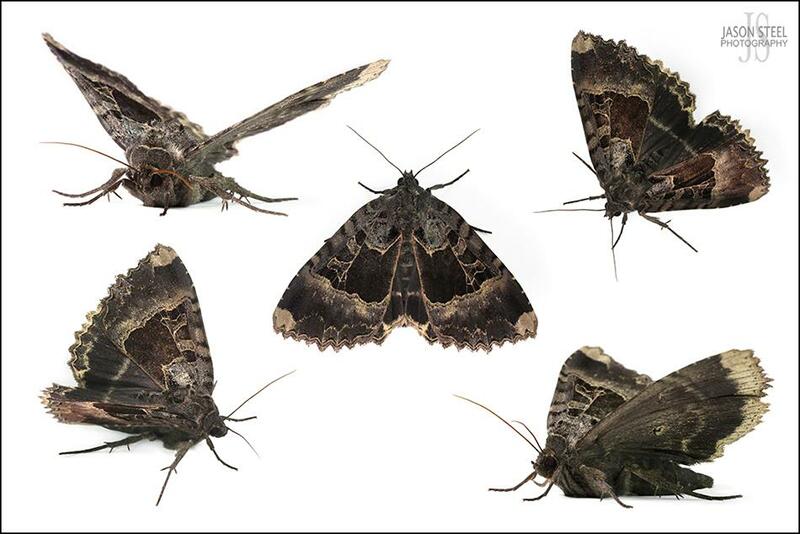 In the south these moths have two broods but in the north only one brood is seen around June. The caterpillars are usually reddish / orange / brown but can be grey or very dark appearing to be almost black. The dorsal stripe can be difficult to see on particularly hairy specimens. The Swallow-Tailed Moth is a large and unmistakable species with a wing-span of 44-60mm across. 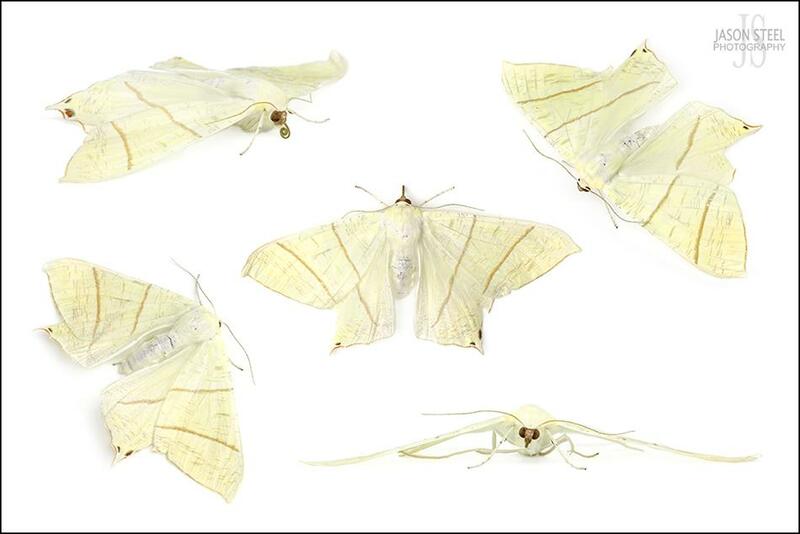 Newly emerged moths have yellow wings which fade to white in older specimens. These moths are strictly nocturnal unless disturbed during the daytime. At night they fly at great speed around woodland, parks and gardens. The caterpillars feed on a variety of woody broadleaves including Blackthorn, Hawthorn, Ivy, Elder and Horse Chestnut. They are usually seen in flight from June to August. Caterpillars overwinter in loose tree bark. 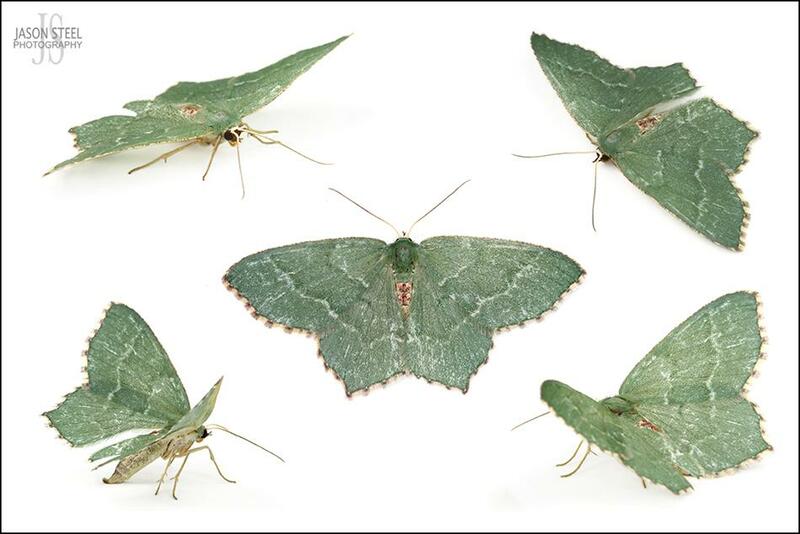 The Common Emerald Moth is one of the few species of green moth in the UK. This species is widespread across England and Wales and can be distinguished by its distinctive shape and chequered fringes. Like all green moths its colour fades quickly as it ages. It is a medium sized moth with a wing-span of 24-27mm and is usually seen flying from dusk in June and July around woodlands and hedgerows. Caterpillars feed on a variety of bushes and trees but have a preference for Hawthorn and Blackthorn. 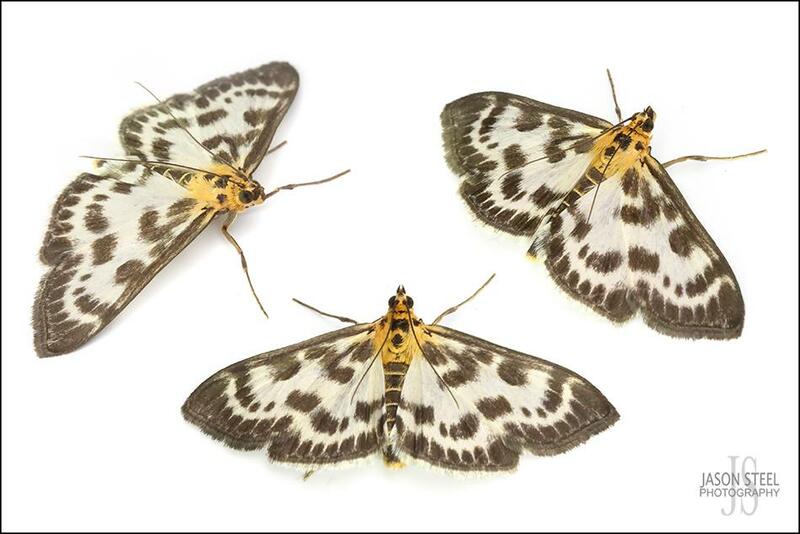 The Small Magpie Moth is a distinctive species with its orange / yellow head and body, and black & white wings. It has a wingspan of 24-28mm and flies in June and July. Caterpillars feed from rolled leaves on Nettles, Bindweed, Woundworts, Horehounds and Mint. The Speckled Yellow Moth is another small and distinctive species with a wingspan of 23-28mm. It has yellow body and yellow wings with brown speckled blotches. 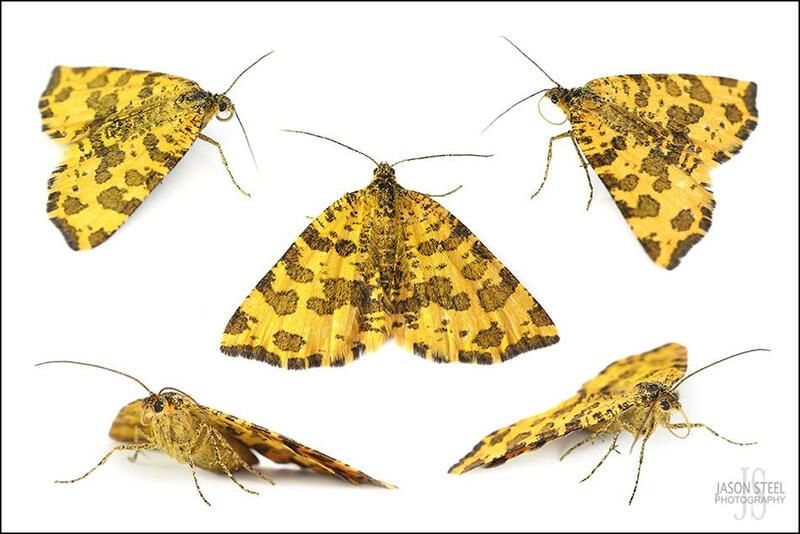 The Speckled Yellow Moth is a diurnal species and is often mistaken for a butterfly when seen in flight on sunny days. Usual habitat is open woodland and bushy grassland sites. Caterpillars usually feed on Woodsage, but have also been recorded on White Dead-Nettle, Woundwort and Yellow Archangel. 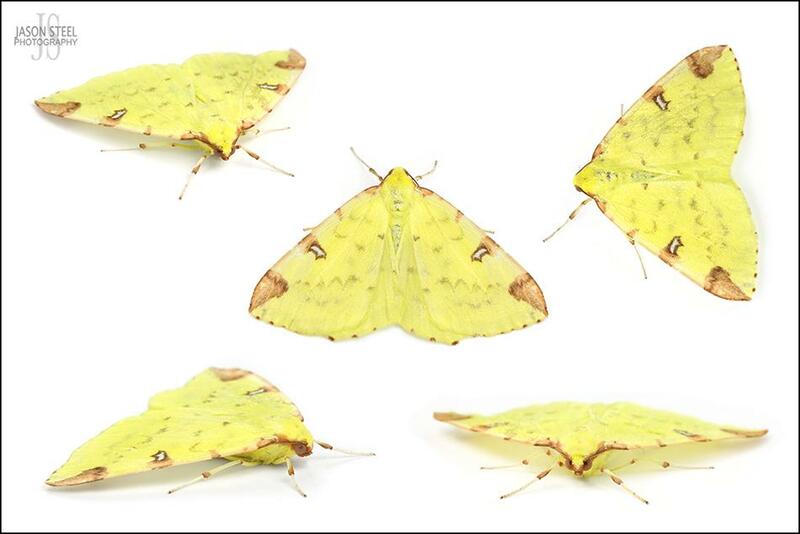 The Brimstone Moth is a small - medium sized moth with a wingspan of 28-42mm, pale yellow colouration and chestnut coloured markings. They are common across the UK. Caterpillars are green or brown and look incredibly like twigs. They feed on a variety of shrubs in the Rose family as well as trees. Adults are seen just before dusk and through the night from April to October. 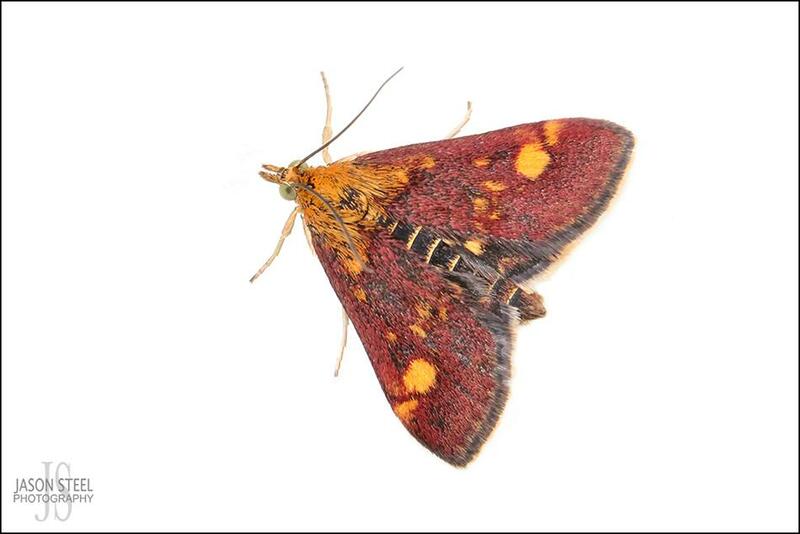 The Mint Moth is a very small and fairly distinctive species with a wingspan of just 18mm. Adults have two broods and can be seen in flight during the daytime from late April to September. 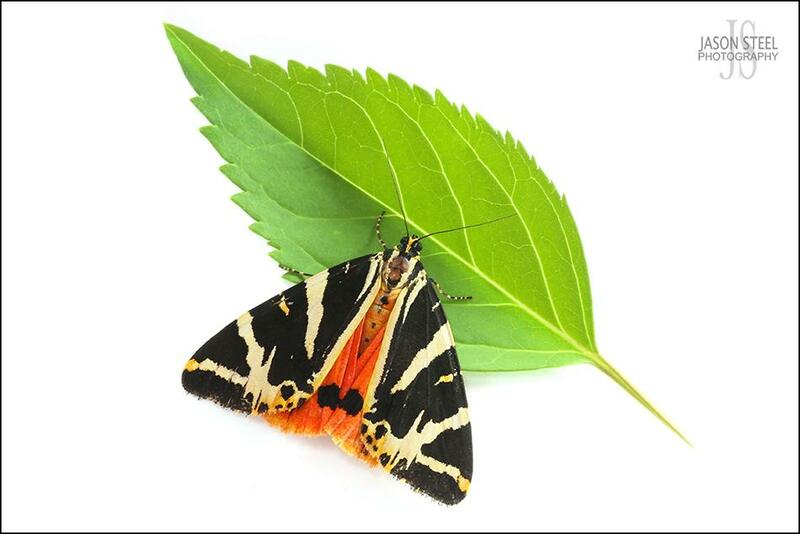 Caterpillars feed on various species of mint plant as well as Thyme. They can be found anywhere that mint is seen growing including chalkland, open grassland, meadows, woodland and gardens. The Poplar Hawk Moth is probably the most common of Britain's Hawk Moths. This is a very large moth with a wingspan of up to 90mm! When completely at rest it sits with its underwings protruding in front of the fore-edge of its upper wings, at its abdomen curved upwards. If disturbed it can flash its lower underwings, revealing a bright orange / brick-red patch. 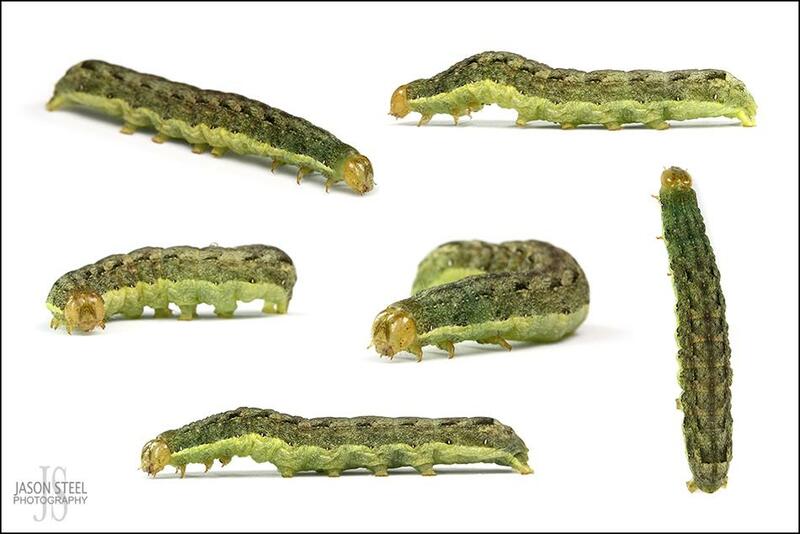 The large green caterpillars grow up to 85mm in length and feed on Poplar, Aspen and Sallow. Adult moths do not feed, and are seen from May - July. 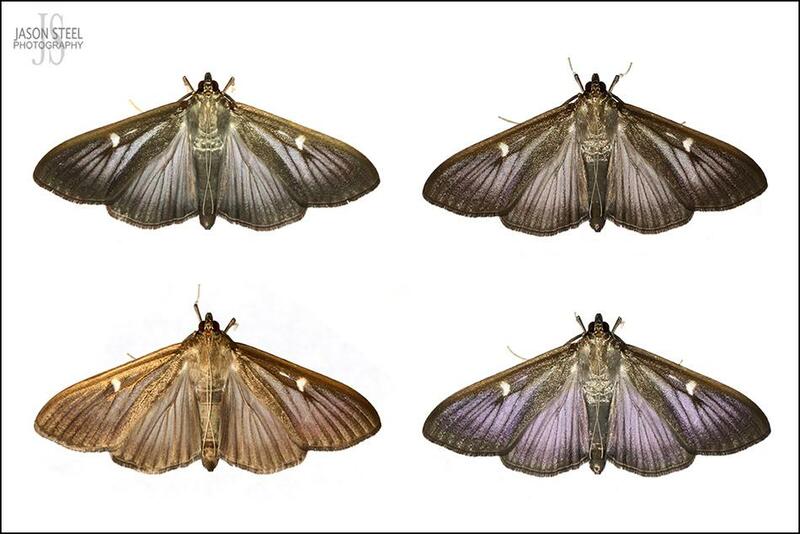 The Box-Tree Moth is an invasive species of moth from Asia. It was first recorded in the UK in 2007 as an adult and 2011 as a caterpillar. It has a wing-span of 40mm and its wings have an iridescent sheen which can vary in colour from purple, gold, and green depending on how the sun's light is reflected. The caterpillars are dangerous because they have no natural predators due to the toxins in their skin making them inedible to birds and other insects in the UK. Box-Tree Moth (Cydalima perspectalis) - Moving the light-source around shows the different shades and colours created by the iridescent sheen on the moth. 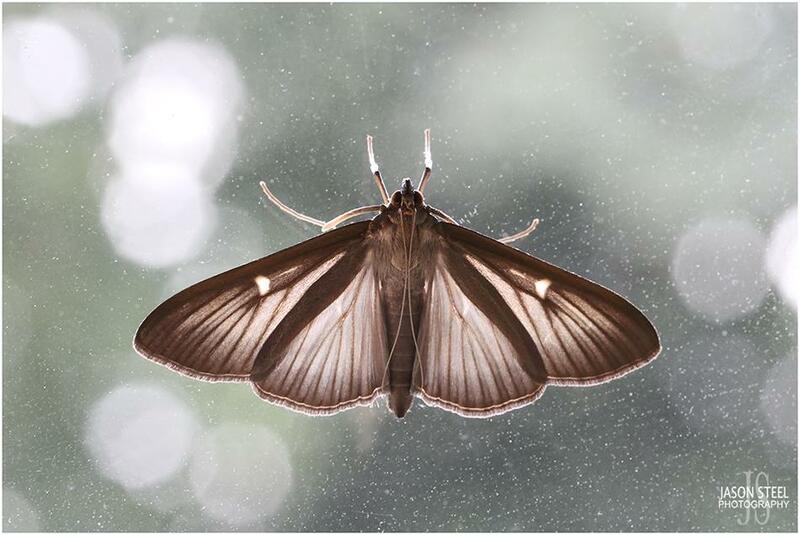 Box-Tree Moth (Cydalima perspectalis) - Back-lit against my kitchen window. A large and common moth found throughout Britain, with a wing-span of 45-55mm. 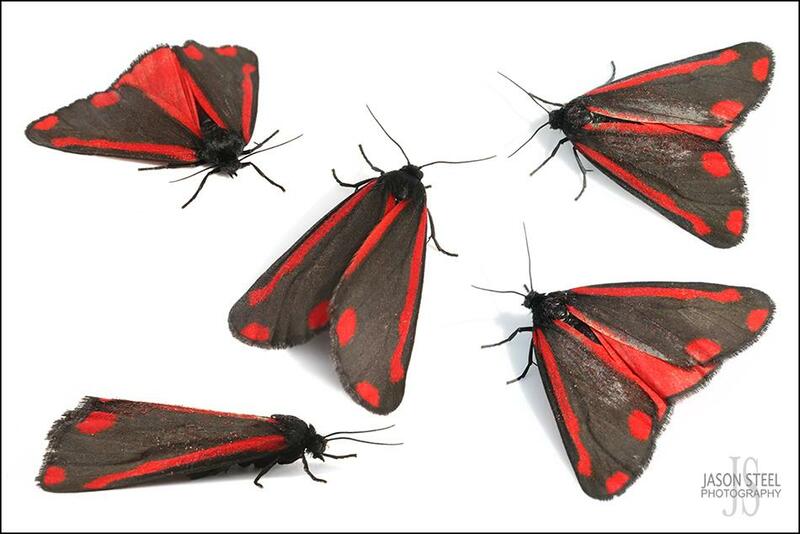 It's possibly the most commonly encountered of the UK's larger moths in July - September. This dull brown / grey moth reveals it's subtle beauty when it flashes its bright yellow / orange underwings. The yellow caterpillars feed on a variety of herbaceous plants and grasses. A common moth found throughout Britain, Europe and North Africa, with a wing-span of 40mm. 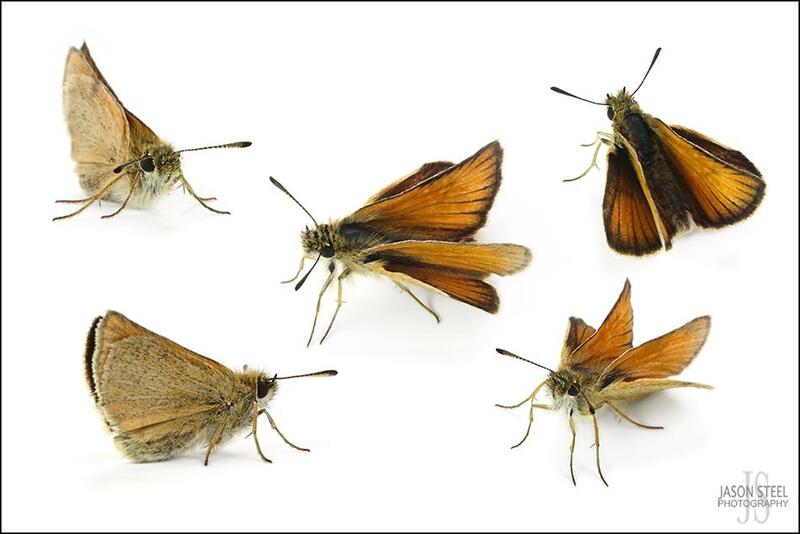 Adult moths fly from May to October. 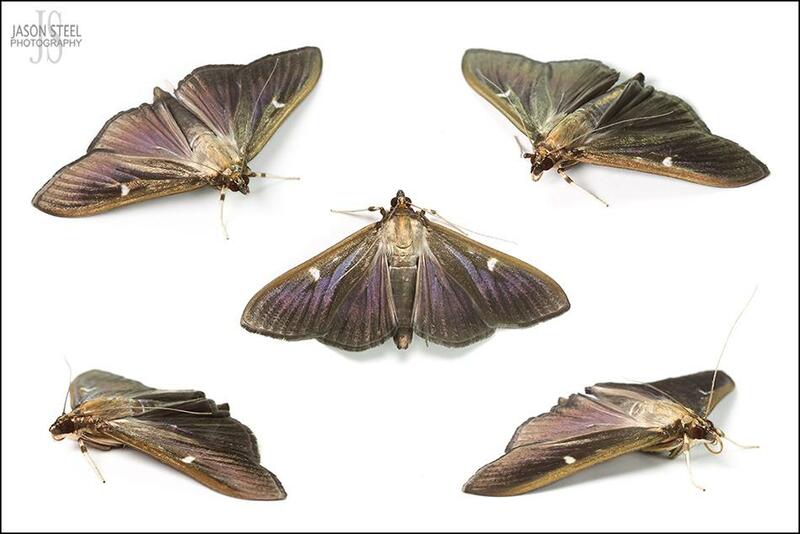 The Cabbage Moth is considered a pest and is highly destructive to many crops especially vegetables. 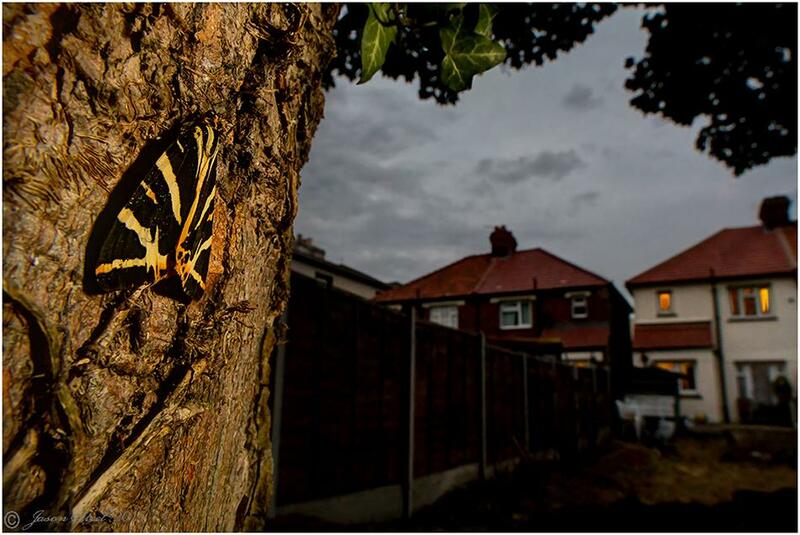 Moths lay 2 or 3 broods of eggs each year and caterpillars can be found throughout the year. Late broods overwinter as pupae in the soil. Adult moths can resemble other species but can always be distinguished by a curved spur on the tibia of the foreleg if examined closely. Cabbage Moth (Mamestra brassicae) late phase. The eggs are pale green in colour but develop dark centres within a few days of being laid. The eggs hatch after about 7 days and caterpillars are fully grown at 40mm in length after a further 30 days. They then pupate in soil and emerge as moths after 14-21 days. 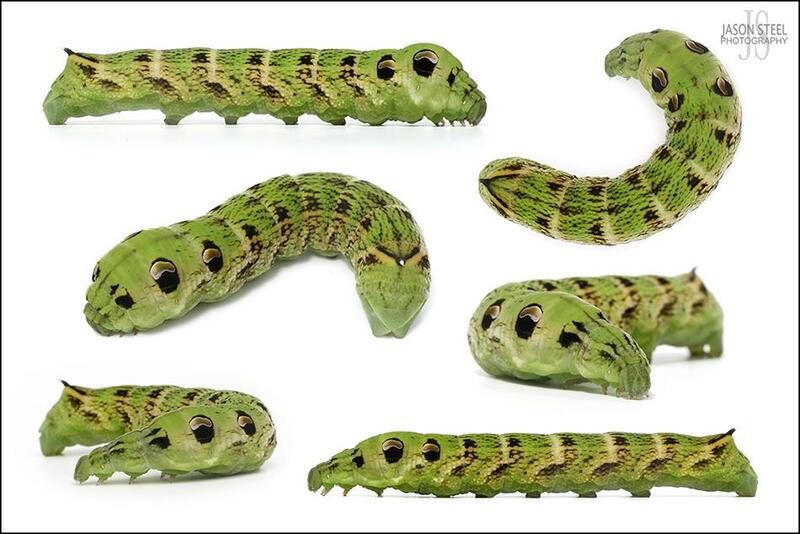 These caterpillars change appearance 4 times as they develop and can vary considerably with different shades of green and brown. This large and once common moth went extinct in Britain around 1900, but 1995 saw the European species appearing again in the SE of England around London. 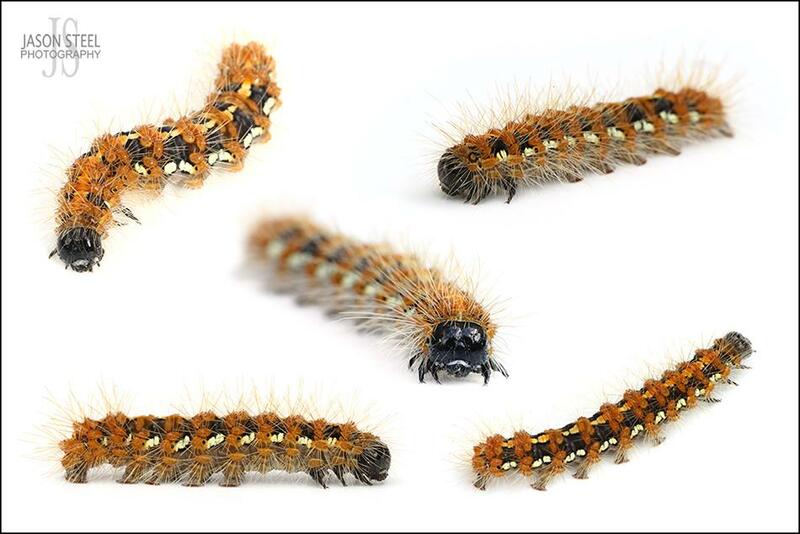 The caterpillars are considered a pest in Continental Europe and a failed attempt was made by DEFRA to eradicate the returning species before it spread. But the Gypsy Moth is now well established in the South-East and is spreading. 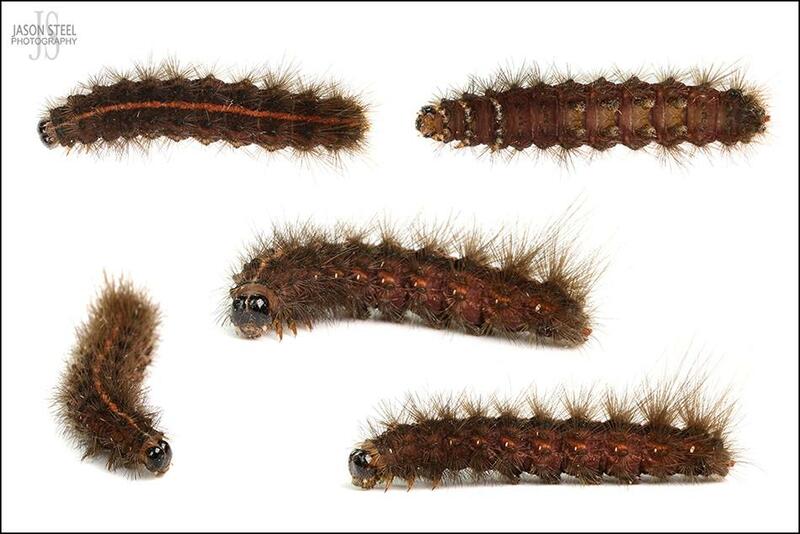 Caterpillars grow up to 70mm in length and feed on foliage of broad-leaved trees. This specimen was found in my garden in SE London under a Sycamore Tree. Adult males have a wing=span of up to 40mm and can fly miles following the scent of females. Females can have a wing-span of up to 60mm or occasionally 70mm, but they rarely fly. The Silver Y Moth can vary considerably in colour but it gets its name from the characteristic "Y" always present on the fore-wings. This moth is an immigrant species coming to the whole of the UK from Europe, anywhere from spring to autumn. It can often be seen flying in both day and night. This is a medium-sized moth with a wing-span of 35-40mm. 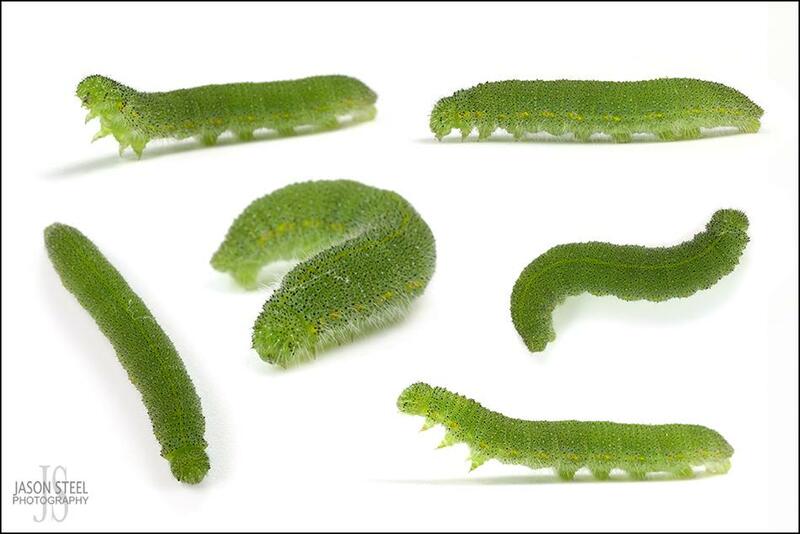 Caterpillars are green in colour and feed on a variety of low plants. Numbers of adults can vary each year but on occasion this species can be very numerous in the south and SE of England. The Old Lady Moth is a large heavily built moth with a wing-span of 55-65mm, sometimes larger. Widespread across the UK and seen flying in July and August. 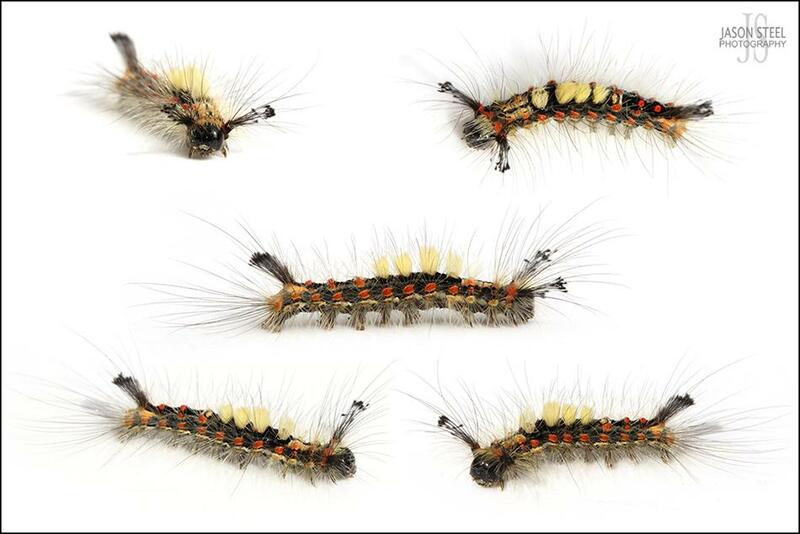 Caterpillars overwinter and emerge in spring to feed on Blackthorn and other shrubs. 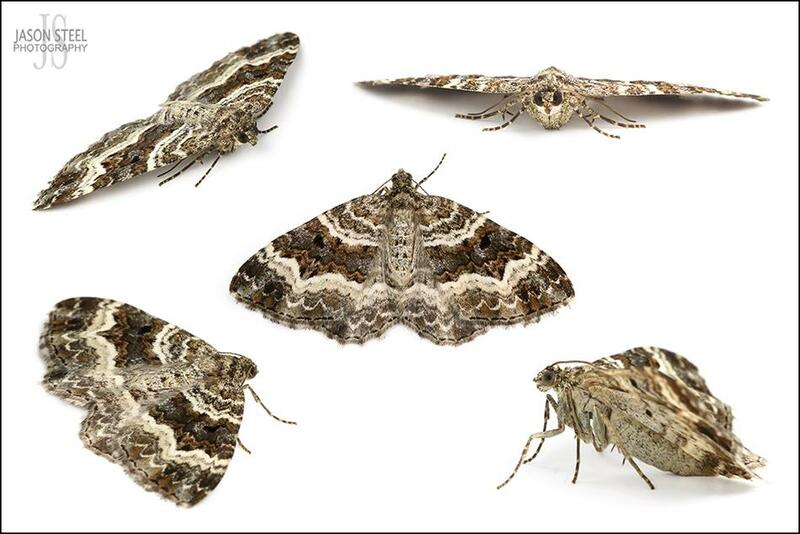 The Common Carpet Moth is a small and common moth with a wing-span of 20-28mm found across the UK. They hide in low vegetation throughout the day and take to the wing from dusk. Caterpillars feed on Cleavers and Bedstraws. 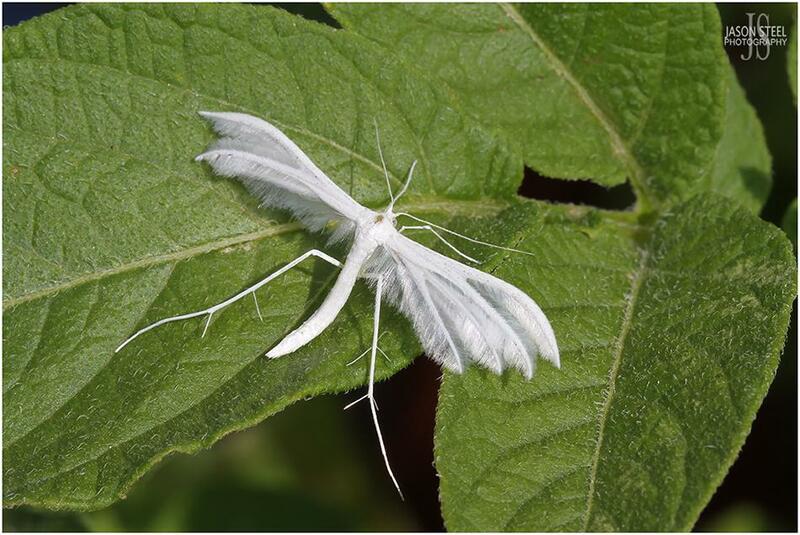 The White Plume Moth is the largest and most distinctive of the British Plume Moths with a wing-span of 24-35mm. They are found in dry grassland, gardens and wasteland across the UK. The front wings are divided into two fingers or plumes, whilst the hind wings are divided into a further three plumes. Adults fly from June to July from dusk and through the night. Caterpillars usually feed on Bindweed (Convolvulus). 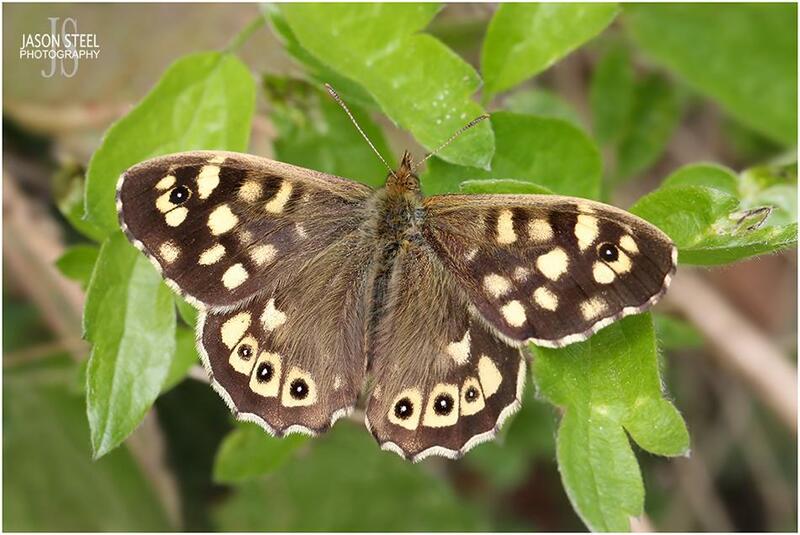 The Speckled Wood Butterfly is an average sized butterfly with a wingspan of 47 - 56mm. It is found right across the country and is especially common in woodland. 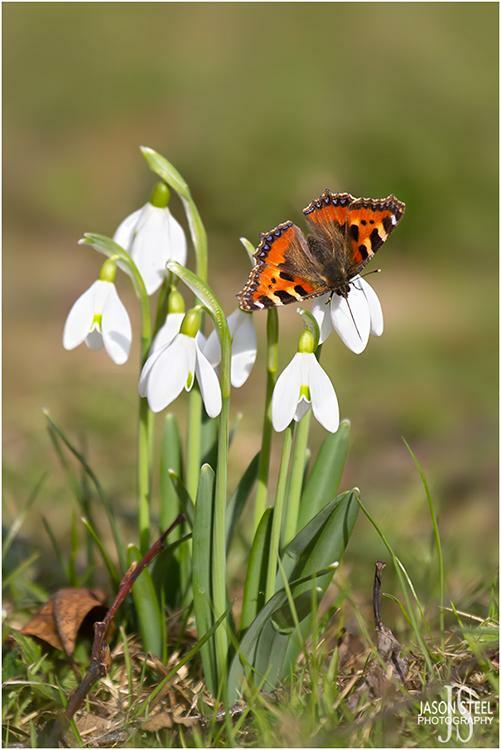 It is often found in more shady areas and on overcast days when most butterflies are not found. The Speckled Wood feeds on Aphid honeydew, which is a sugary secretion left by Aphids as they feed on plant juices. Early and late in the year when Aphid activity is low the Speckled Wood feeds on flowers. The caterpillars feed on various grasses and are not considered as pests by gardeners. A common and small - medium sized butterfly with a wingspan of 32-57mm. 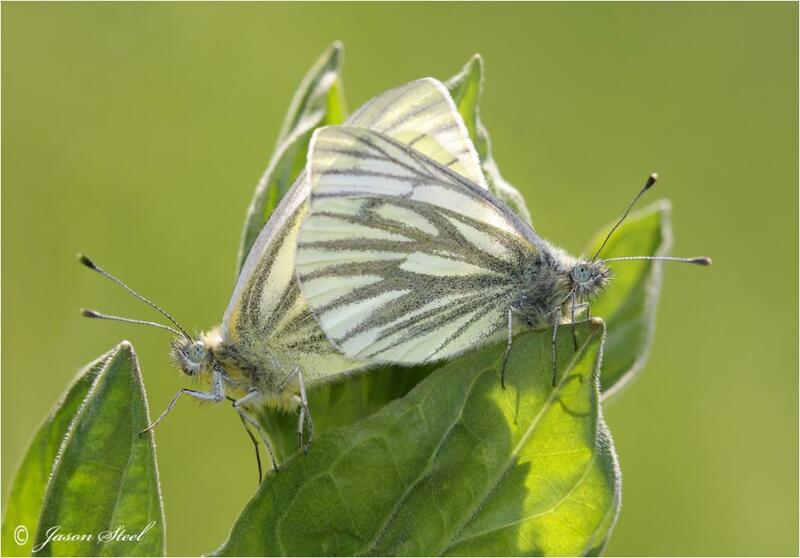 This and the Large White Butterfly are often both referred to as Cabbage White Butterflies in the UK. 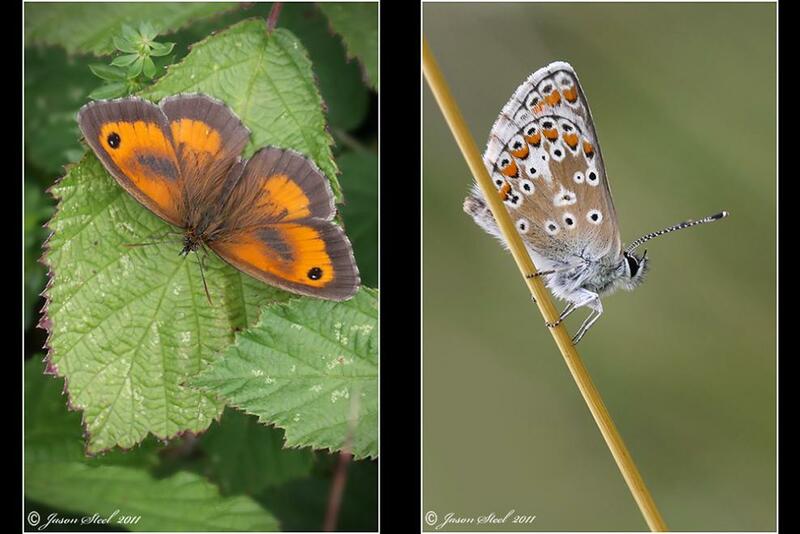 Found as a caterpillar from June-October, and in adult butterfly form from May-September. 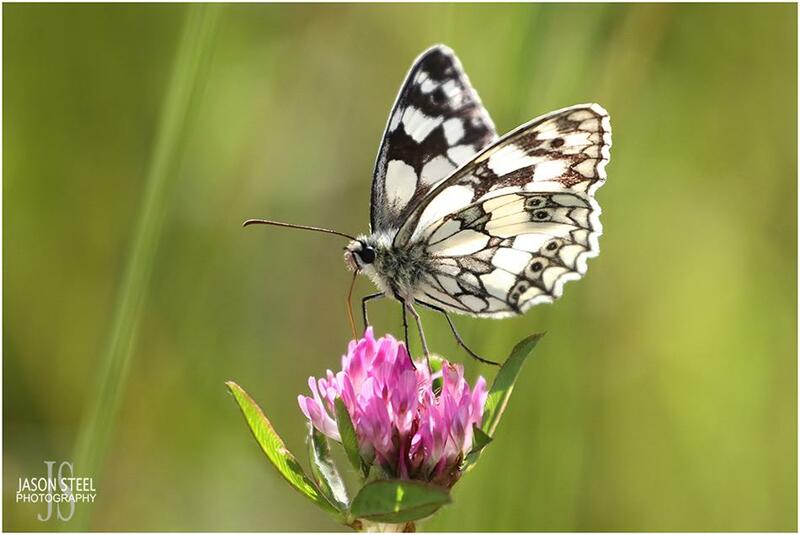 The Small White is not considered to be quite as destructive by gardeners as the Large White Butterfly. A small sized butterfly with a wingspan of 35mm. The wings are bright blue and the females have black edges. The underside of the wings is pale blue which makes the species identifiable from the similar Common Blue Butterfly. These are usually the first of the blue butterflies to emerge and unlike the other species which tend to stay near ground level, Holly Blues are often seen flying around the tops of trees. 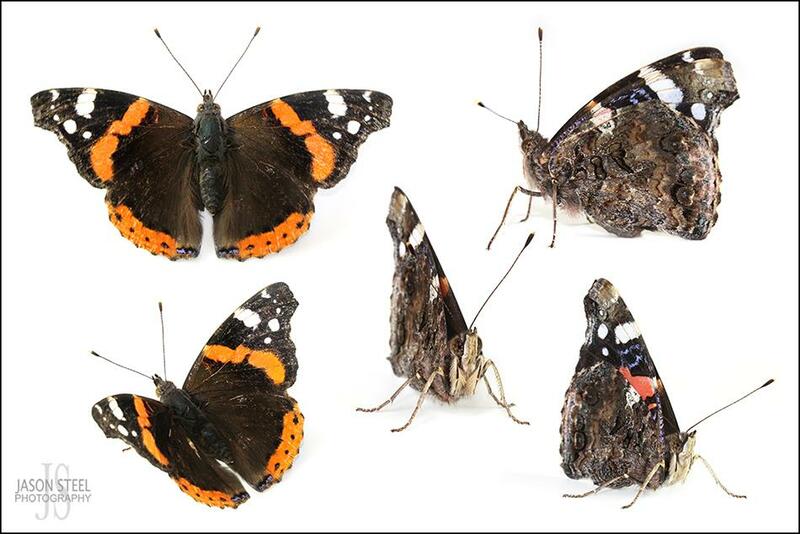 As the old saying goes, "One man's trash is another man's (or butterfly's) . . . basking spot! 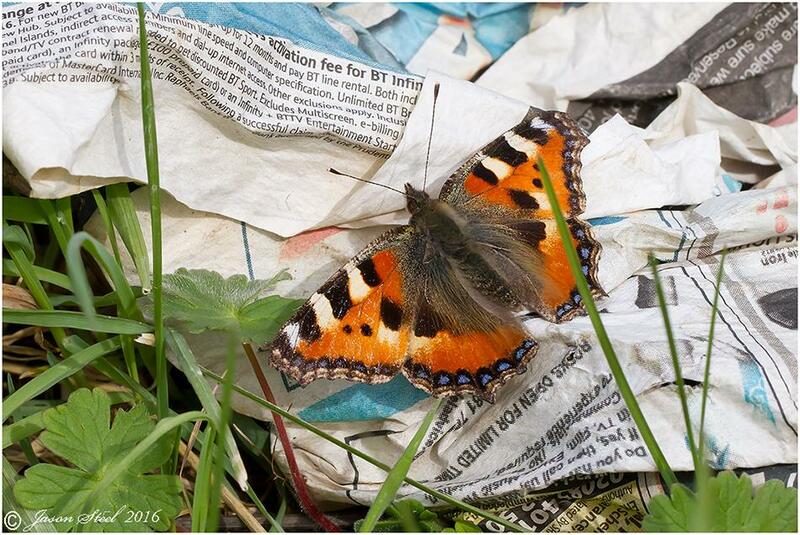 This Small Tortoiseshell Butterfly enjoys the April sunshine. A medium sized butterfly with an average wingspan of 55mm for males and 62mm for females. 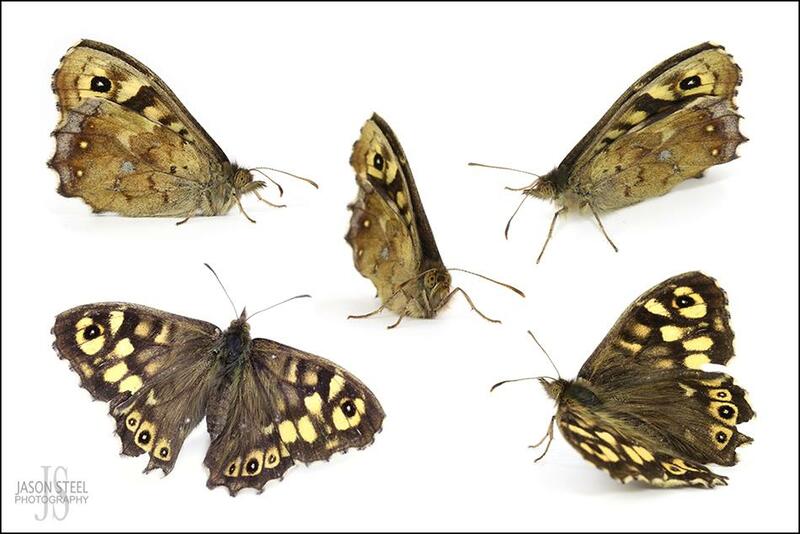 A common sight in UK gardens and meadows from April to September. Occasionally emerging in March until October in long warm summers. Found on nettles and wildflowers. Second generation Tortoiseshells can emerge as late as October and then hibernate in hollow trees and outbuildings along with Peacock Butterflies. Numbers have declined in recent years, possibly due to the increase in parasitic flies. 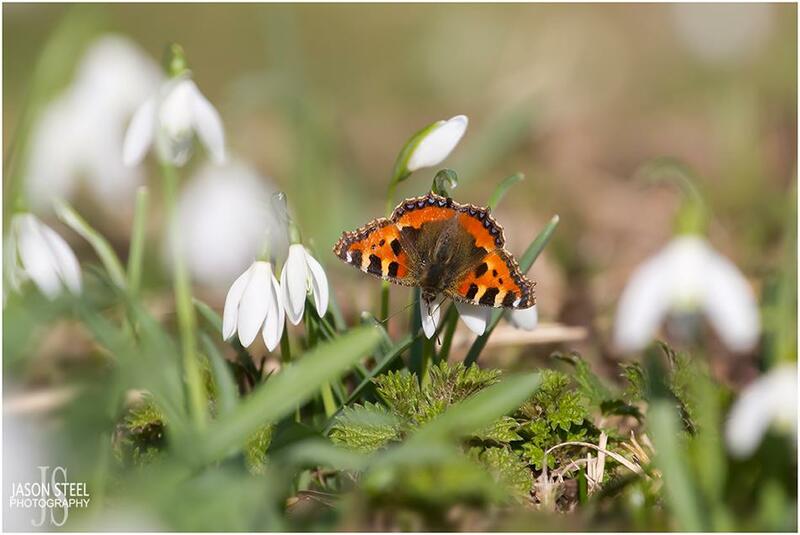 Fresh from hibernation, this Small Tortoiseshell Butterfly drinks from snowdrops in February. 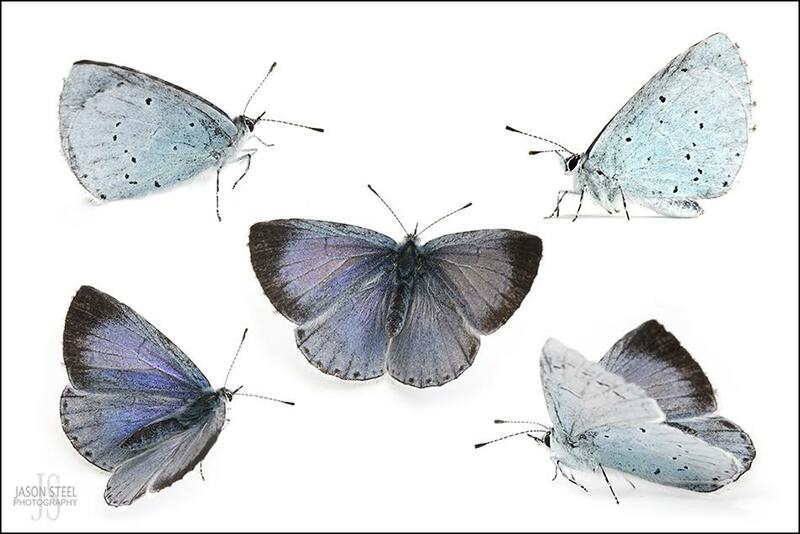 A medium sized butterfly with a wingspan of 48mm for males and 52mm for females. Found in woodland clearings, meadows, hedgerows, country lanes. Not often seen in open ares without cover. The dark colouration of its wings enables it to warm up quickly and it is one of the few British species seen flying on dull overcast days. A large sized butterfly with a wingspan of 64-72mm for males and 70-78mm for females. This species is found right across Britain but most of the specimens seen are migrants from Europe. In the south of England some can survive our milder winters and are resident, and these can be seen active throughout the year including sunny days in winter. Caterpillars feed on Common Nettle. 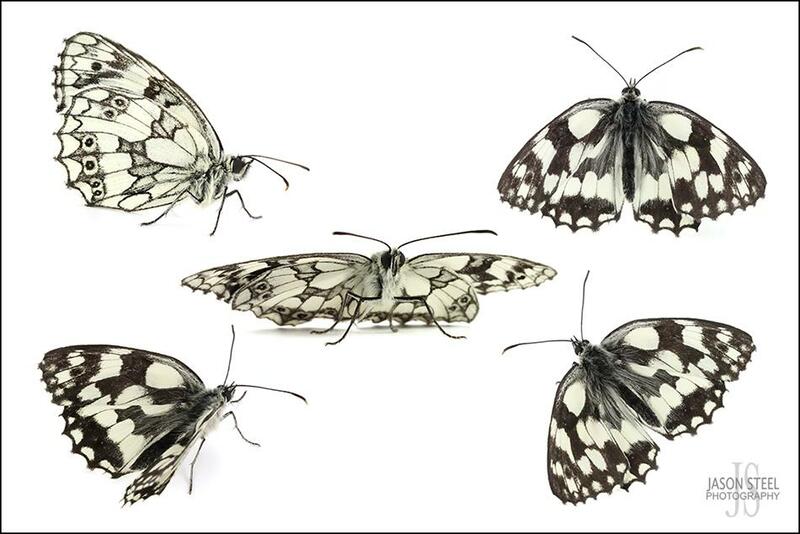 A medium sized butterfly with black and white checked wings. They have a wingspan of 53mm for males and 58mm for females. Found in long grass with a preference for wild purple flowers such as thistles. Usually seen in July and August. 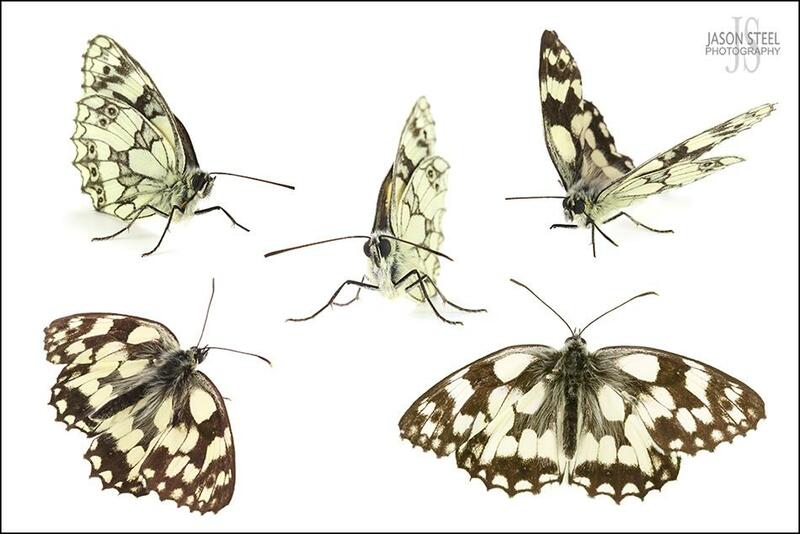 Females tend to be more brown and cream as oppose to the male's black and white colouration. 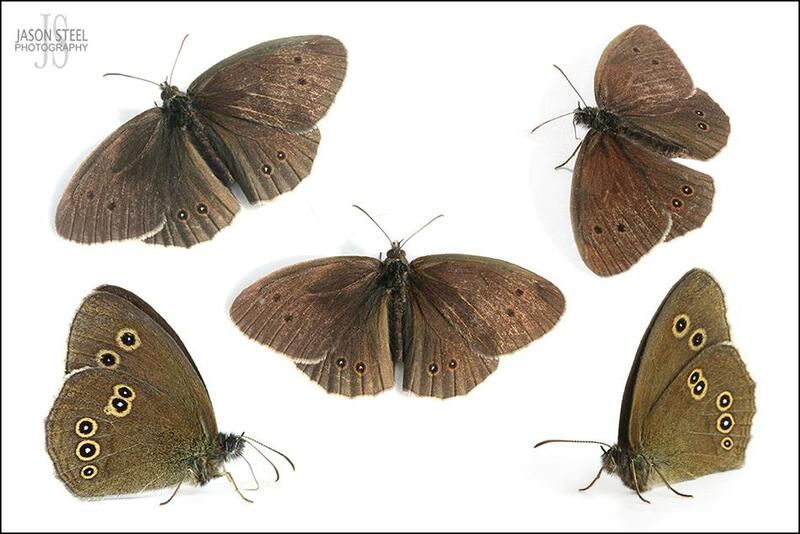 These large butterflies have a maximum wingspan of around 55mm, but can be as large as 75mm.. They have a vast range and can be found across the UK, Europe and Asia as far as Japan. They are predominantly a rusty red colour with large and distinctive eye markings on the wings. 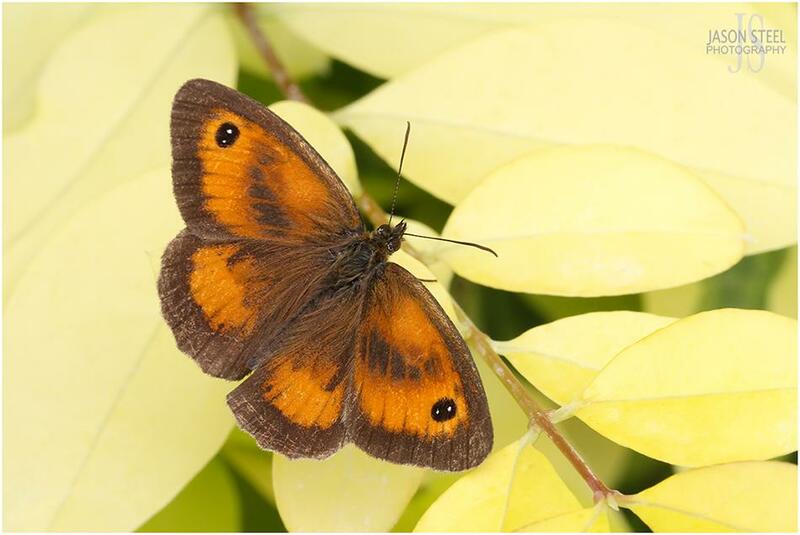 The underside is cryptically marked brown or black and can help disguise the butterfly as a dead leaf. In September these butterflies begin to hibernate in hollow trees or buildings such as sheds and outhouses where they hang upside down. They emerge in early spring, usually March. The eggs are laid in a silky sac at the tip of nettle leaves. When large enough the caterpillars will leave the sac and find nettles of their own to feed on. 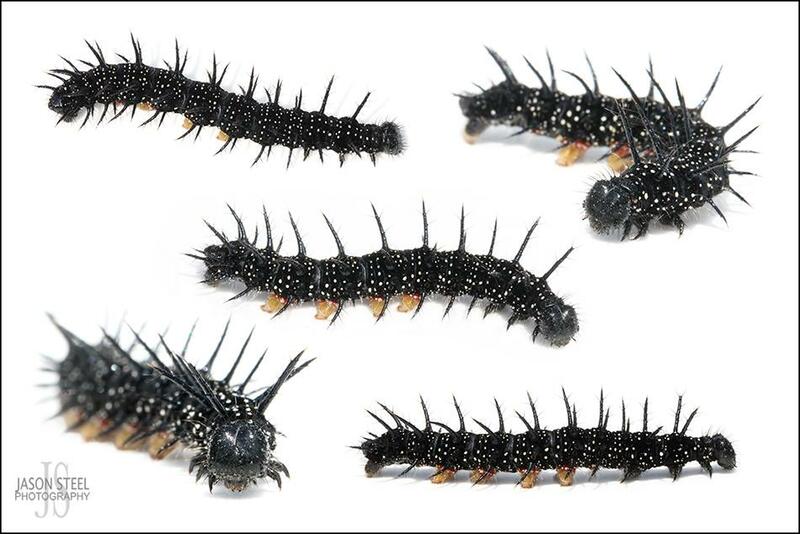 The caterpillars are black and spiky in appearance with white flecks and orange / black legs. If predators are not deterred by the large eye-spots, and are not fooled by the leaf imitation, then these butterflies can even produce an audible hiss! 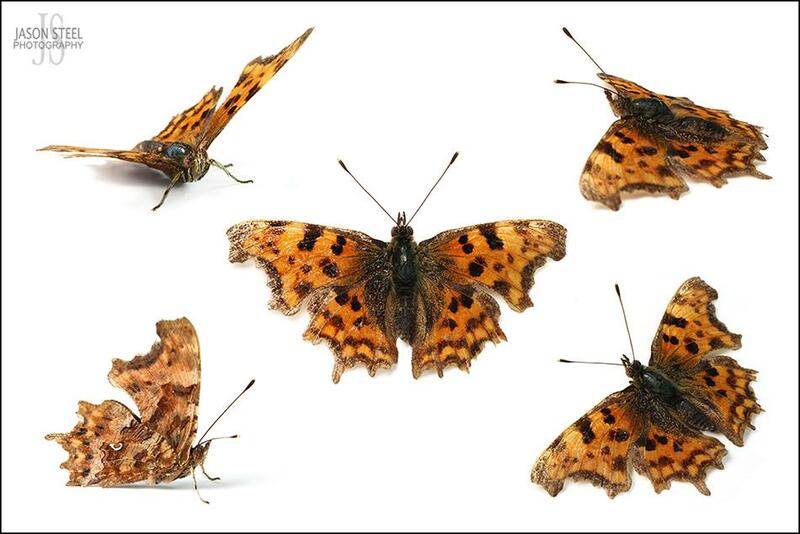 A weathered Comma Butterfly with missing legs and battered wings. Photographed in late July. 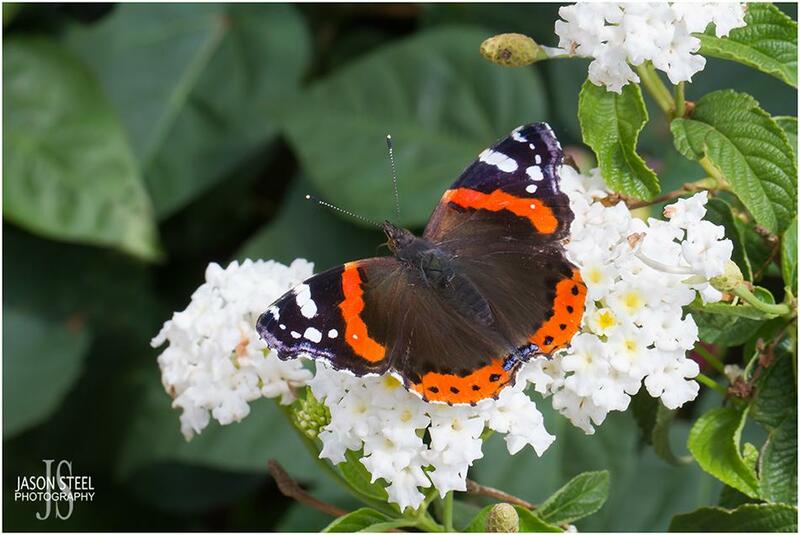 A medium-sized butterfly found across England and Wales with a wing-span of 50-64mm. Caterpillars usually feed on Common Nettles and Hops for around 5 weeks. 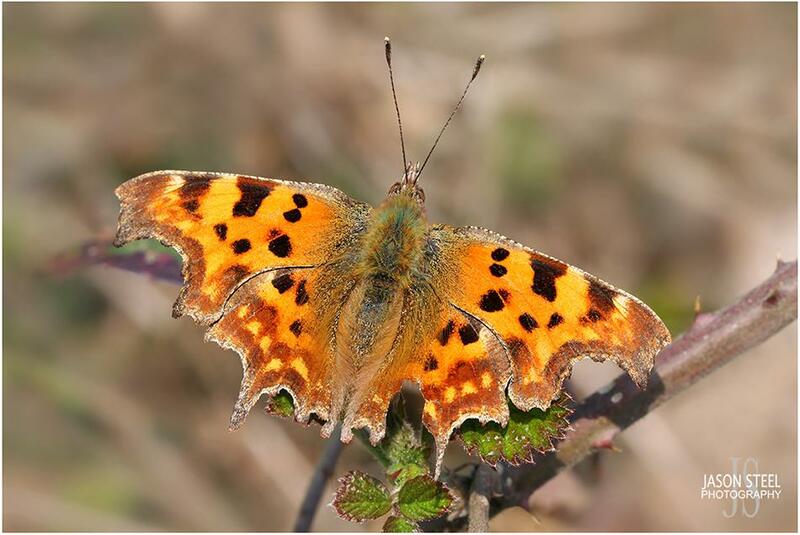 This butterfly gets its name from the single white mark on its under-wings that resemble a comma. The Gatekeeper is found across the southern half of the UK. It is a medium sized butterfly with a wingspan of 37-48mm and can be seen from the end of July until the middle of September. 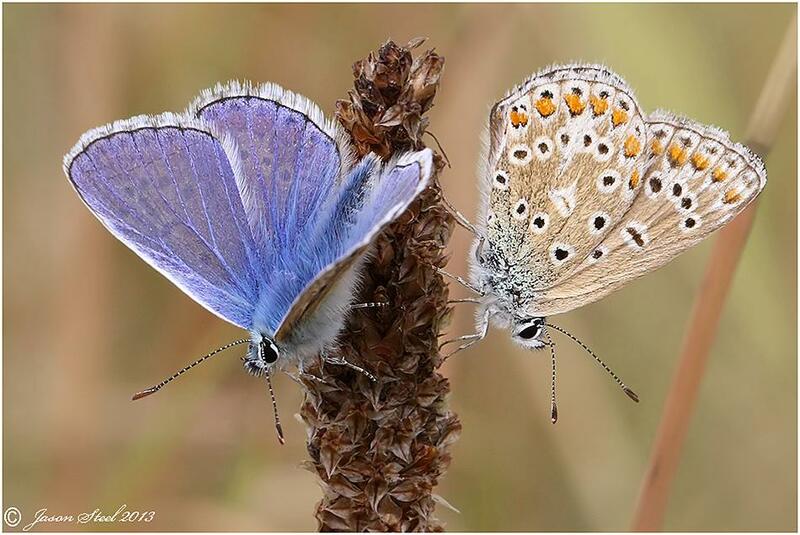 The Common Blue is found right across the UK with the exception of Ireland. 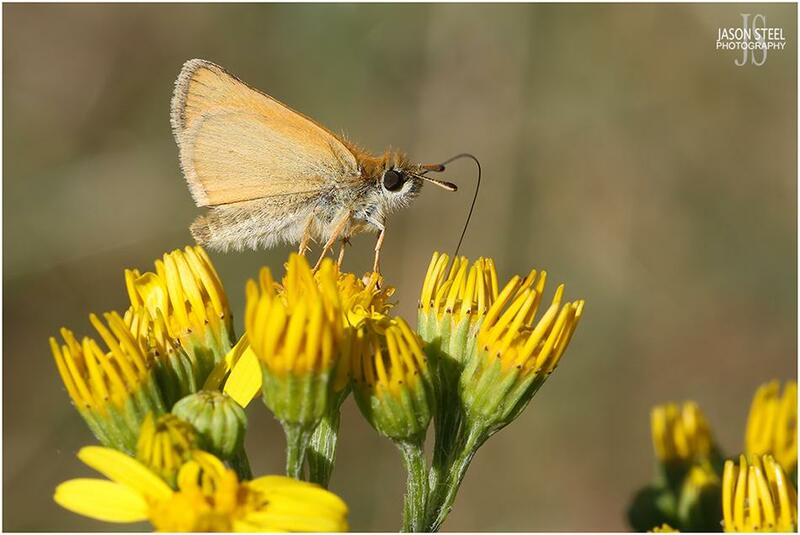 It is a small butterfly with a wingspan of 29-36mm and can be seen from the end of May right up to the end of September. 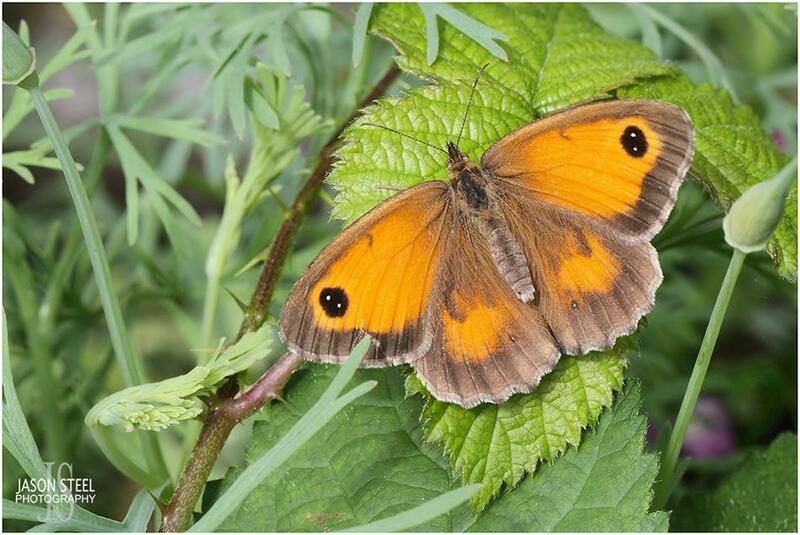 A small-sized butterfly found across the UK with a wing-span of 27-34mm. Caterpillars make tube-shaped retreats by curling over the edges of leaves. In the early stages they feed from inside the tube but later they will leave the tube to feed on nearby leaves. Caterpillars feed mainly on Yorkshire-fog Grass (Holcus lanatus), but have also been noted to feed on a few other grass species too. 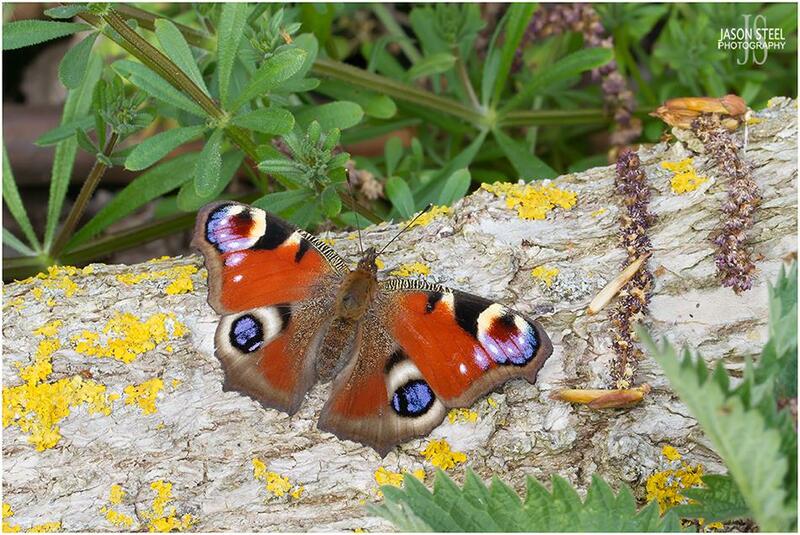 One of Britain's most widespread butterflies with a wing-span of up to 52mm. 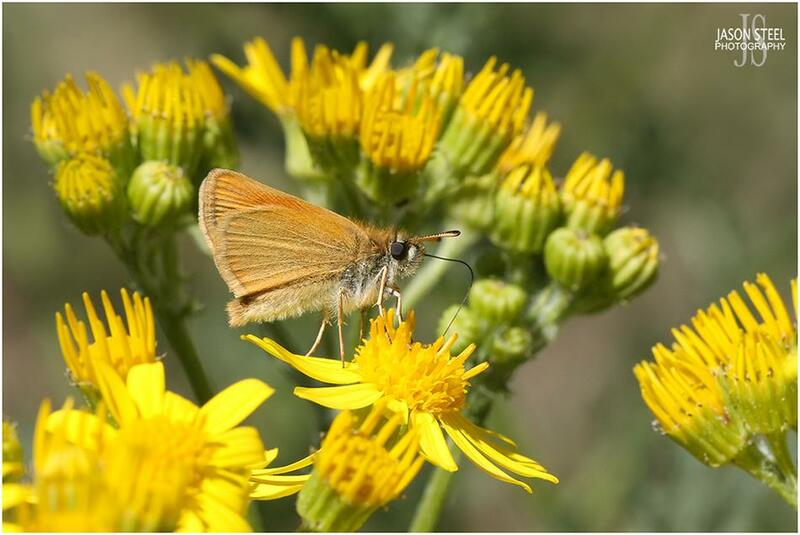 This species usually favours damp grassland and woodland sites, and is also found in meadows, gardens and parks. 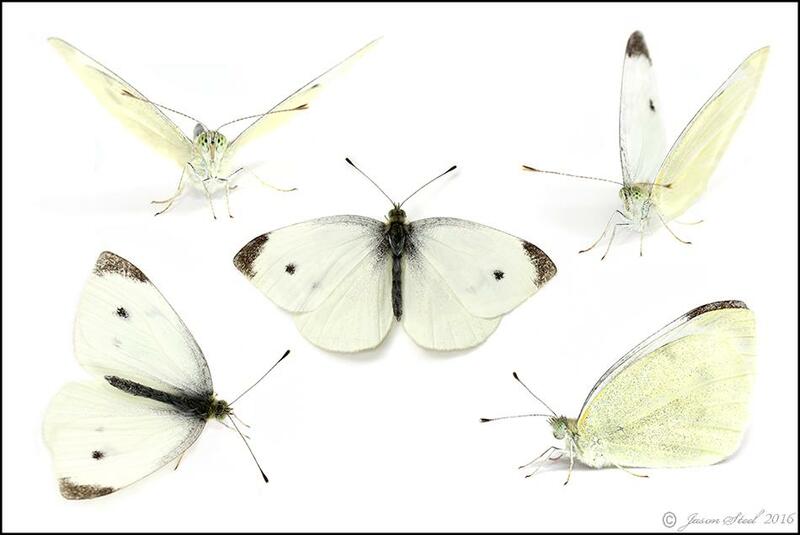 It is often mistaken for the Small White Butterfly.